멀티모달 네트워크 요소(14)는 하나 이상의 디바이스(12, 16) 상에서 다른 사용자 에이전트 프로그램(30, 34)을 통해 동시 멀티모달 통신 세션을 용이하게 한다. Multimodal network element 14 facilitates the concurrent multimodal communication session with another user agent program (30, 34) on one or more devices (12, 16). 예를 들면, 스피치 엔진 및 호출/세션 종료를 포함하는 음성 게이트웨이(16)의 음성 브라우저(34)와 같이 음성 모드로 통신하는 사용자 에이전트 프로그램이 모바일 디바이스(12) 상에서 그래픽 브라우저(30)와 같이 다른 모달리티로 동작하는 다른 사용자 에이전트 프로그램과 동기화된다. For example, as shown in a graphical browser 30. The user agent programs that communicate in the voice mode, such as a voice browser 34 of the voice gateway 16, which includes a speech engine and the call / session ends on the mobile device 12 other It is synchronized with the other user agent program operating in modalriti. 복수의 사용자 에이전트 프로그램(30, 34)이 세션 동안에 컨텐트 서버(18)와 동작가능하게 결합되어 동시 멀티모달 인터액션을 가능하게 한다. A plurality of user agent programs 30 and 34 are operatively coupled to the content server 18 during a session allows for simultaneous multi-modal interaction. 본 발명은 일반적으로는 통신 시스템 및 방법에 관한 것으로, 특히 멀티모달 통신 시스템 및 방법에 관한 것이다. The present invention generally relates to, and more particularly multimodal communication system and method relates to a communication system and method. 핸드헬드 디바이스, 이동 전화기, 랩탑, PDA, 인터넷 가전, 비이동형 디바이스 및 다른 적절한 디바이스와 같은 통신 디바이스와 관련한 기술의 떠오르는 분야는 정보 및 서비스로의 액세스를 위한 멀티모달 인터액션의 어플리케이션이다. Emerging fields of technology related to the communications devices, such as handheld devices, mobile phones, laptops, PDA, Internet appliances, non-portable devices and other suitable devices are the application of a multi-modal interaction for access to information and services. 통상, 통신 디바이스 상에 상주하는 것은 브라우저와 같은 적어도 하나의 사용자 에이전트 프로그램, 또는 사용자 인터페이스로서 동작할 수 있는 임의의 다른 적절한 소프트웨어이다. Resident on the conventional communication device, it is at least one user agent program, or any other suitable software that may operate as a user interface such as a browser. 사용자 에이전트 프로그램은 요구(사용자 에이전트 프로그램을 통해 또는 다른 디바이스 또는 소프트웨어 어플리케이션으로부터 입력됨)를 페치하는 것에 응답하여, 페치된 정보를 수신하고, 내부 또는 외부 접속을 통해 컨텐트 서버를 네비게이션하며, 정보를 사용자에게 제공할 수 있다. User agent program is required (which is input through the user agent program or from other devices or software applications) to the response to the fetching, receiving the fetched information, and navigation to content servers through the internal or external access, user information It can provide. 사용자 에이전트 프로그램은 그래픽 브라우저, 음성 브라우저, 또는 본 기술분야의 통상의 기술자에 의해 주지되어 있는 임의의 다른 적절한 사용자 에이전트 프로그램일 수 있다. The user agent program may be a graphical browser, voice browser, or the art of conventional well known by the technicians of any other suitable user agent program of. 그러한 사용자 에이전트 프로그램은 J2ME 어플리케이션, 네스케이프, 인터넷 익스플 로러, 자바 어플리케이션, WAP 브라우저, 인스턴트 메시징, 멀티미디어 인터페이스, 윈도우즈 CE, 또는 임의의 다른 적절한 소프트웨어 구현을 포함하고, 이들로 제한되지 않는다. Such a user agent program is not included in the J2ME application, Netscape, Internet exploit roreo, Java applications, WAP browser, instant messaging, multimedia interface, Windows CE, or any other suitable software implementation of and limits to them. 멀티모달 기술은 사용자가 음성, 데이터, 비디오, 오디오 또는 다른 정보와 같은 정보, 및 이메일, 날씨 업데이트, 은행 거래 및 뉴스 또는 다른 정보를 사용자 에이전트 프로그램을 통해 하나의 모드로 액세스하고, 다른 모드로 정보를 수신할 수 있도록 허용한다. Multi-modal technology users to access information and email, weather updates, banking and news or other information, such as voice, data, video, audio, or other information in a single mode through a user agent program and information in different modes allows to receive. 특히, 사용자는 페치된 요구를 마이크로폰에 말하는 것과 같이, 하나 이상의 모달리티로 정보 페치 요구를 제출한 후, 사용자는 리턴된 정보를 표시 스크린 상에 뷰잉 포맷으로 제공하는 그래픽 브라우저와 같은 것을 통해, 페치된 정보를 동일한 모드(즉, 음성) 또는 다른 모드로 수신할 수 있다. In particular, the user is the one submitting the information fetch request to one or more modalriti as saying the fetch request to the microphone after the user through such things as providing a viewing format the returned information on a display screen, graphical browser, fetch the information can be received in the same mode (i.e., voice) or any other mode. 통신 디바이스 내에, 사용자 에이전트 프로그램은 네트워크 또는 다른 터미널 디바이스에 접속된 디바이스 상에 상주하는 표준 웹 브라우저 또는 다른 적절한 소프트웨어 프로그램과 유사한 방식으로 동작한다. In the communication device, user agent program operating in a similar manner to a standard web browser or other suitable software program resident on the devices connected to a network or other terminal device. 그러한 것으로서, 사용자가 세션 동안에 복수의 모달리티로 통신을 용이하게 하도록 하나 이상의 사용자 입력 및 출력을 활용할 수 있게 하는 멀티모달 통신 시스템이 제안되었다. As such, the multi-modal communications system that enables the user to utilize the user input and output one or more so as to facilitate communication with a plurality of modalriti during the session have been proposed. 사용자 에이전트 프로그램은 다른 디바이스 상에 배치될 수 있다. User agent program may be located on a different device. 예를 들면, 음성 게이트웨이와 같은 네트워크 요소는 음성 브라우저를 포함한다. For example, a network element, such as a voice gateway comprises a voice browser. 예를 들면, 핸드헬드 디바이스는 WAP 브라우저 또는 다른 적절한 텍스트 기반 사용자 에이전트 프로그램과 같은 그래픽 브라우저를 포함할 수 있다. For example, the handheld device may include a graphical browsers such as WAP browser or other appropriate text-based user agent program. 그러므로, 멀티모달 성능으로, 사용자는 하나의 모드로 입력하고 다른 모드로 정보를 수 신할 수 있다. Therefore, the multi-modal capabilities, a user may communicate the input to the single mode, and the number of information in different modes. 사용자 입력을 2개의 다른 모달리티로 제공하려고 시도하는, 예를 들면 음성 모드로 일부 정보를 입력하고 다른 정보를 촉각 또는 그래픽 인터페이스를 통해 입력하려고 시도하는 시스템이 제안되었다. Attempting to provide user input to the two other modalriti, for example, it has been proposed a system to enter some information into voice mode and attempt to enter other information via tactile or graphical interface. 하나의 제안은 예를 들면 사용자가 우선 음성을 입력한 후 음성 입력이 완료된 후 짧은 메시지를 전송하도록 요구되는 직렬 비동기 접근법을 이용하는 것이다. One proposal for example is to use a serial asynchronous approach is required to send a short message after the user has completed the first, enter the voice audio input. 그러한 시스템의 사용자는 동일한 세션 동안에 모드를 수동으로 스위칭해야 한다. Users of such systems should be switched to manual mode during the same session. 그러므로, 그러한 제안은 귀찮은 것이다. Therefore, such a proposal is troublesome. 다른 제안된 시스템은 하나의 사용자 에이전트 프로그램 및 현재의 HTML 페이지내의 마크업 언어 태그를 이용하여, 예를 들면 사용자가 검색 단어를 타이핑하는 대신에 음성을 이용하여 웹 페이지를 네비게이션한 후 동일한 HTML 페이지가 사용자로 하여금 텍스트 정보를 입력할 수 있도록 허용하는 것이다. The other proposed system uses a single user agent program and the current markup language tag in an HTML page, for example, after a user navigate Web pages using your voice instead of typing in a search word the same HTML page allowing the user to allow you to enter text information. 예를 들면, 사용자가 단어 "도시"를 말하고 어드레스에 타이핑하여 컨텐트 서버로부터 가시적인 지도 정보를 얻는 것이다. For example, the user would speak the words "City", to obtain a visible map information by typing in the address from the content server. 그러나, 그러한 제안된 방법은 통상 모달리티를 다르게 하는 멀티모드 입력들이 하나의 디바이스 상의 동일한 에이전트 프로그램에 입력되도록 강제한다(동일한 브라우저를 통해 입력됨). However, such a proposed method is a multi-mode input to a different conventional modalriti are forced to be input to the same agent program on one device (entered through the same browser). 그러므로, 음성 및 텍스트 정보가 통상 동일한 HTML 형식으로 입력되어 동일한 사용자 에이전트 프로그램을 통해 처리된다. Therefore, the conventional audio and text information is entered in the same HTML format are processed through the same user agent program. 그러나, 이러한 제안은 단일 디바이스 상에서 동작하는 단일 사용자 에이전트 프로그램의 이용을 요구한다. However, such a proposal requires the use of a single user agent program operating on a single device. 따라서, 제한된 처리 성능 및 저장 용량을 가지는 모바일 디바이스와 같은 덜 복잡한 디바이스에 대해, 복잡한 브라우저는 디바이스 성능을 저하시킬 수 있 다. Thus, for less complex devices, such as mobile devices with limited processing power and storage capacity, complex browser is can degrade device performance. 또한, 그러한 시스템은 다른 사용자 에이전트 프로그램을 통해 정보의 동시 멀티모달 입력을 활용할 수 없다. In addition, such a system can not take advantage of the simultaneous multi-modal input of information through the different user agent programs. 더구나, 다른 어플리케이션 또는 다른 디바이스 중에서 분산된 처리를 허용하는 다중 디바이스에 걸친 동시 멀티모달 입력을 제공하는 것이 바람직하다. Also, it is desirable to provide a concurrent multimodal input across multiple devices that allows for distributed processing, among other applications or other devices. 또 다른 제안은 멀티모달 게이트웨이 및 멀티모달 프록시를 이용하는 것으로서, 멀티모달 프록시는 컨텐트를 페치하여 통신 디바이스의 사용자 에이전트 프로그램(예를 들면, 브라우저) 및 예를 들면 네트워크 요소 내의 음성 브라우저에 컨텐트를 출력하여 시스템은 디바이스에 대한 음성 및 텍스트 출력을 모두 허용한다. Also as another proposal it is using a multimodal gateways, and multi-modal proxy, the multimodal proxy user agent program of the communication device to fetch the content (e.g., a browser), and for example, outputs the content to the voice browser, in the network element the system allows both voice and text output to the device. 그러나, 그러한 접근법은 다른 모드의 페치된 정보를 단일 사용자 에이전트 프로그램 또는 브라우저에 출력하도록 요구하는 단일 사용자 에이전트 접근법이므로, 다른 어플리케이션을 통해 다른 모드로 사용자에 의해 정보의 동시 입력을 허용하지 않을 것으로 보인다. However, such an approach is a single-user-agent approach, which needs to output the fetched information in a different mode to a single user agent program or browser, unlikely to allow simultaneous input of information by the user via the another application to another mode. 따라서, 개선된 동시 멀티모달 통신 장치 및 방법에 대한 요구가 존재한다. Therefore, a need exists for an improved apparatus and method for concurrent multimodal communication. 본 발명은 유사한 참조부호는 유사한 구성요소를 나타내는 첨부된 도면을 통해 예를 들어 예시되고 이들로 제한되지는 않는다. The invention like reference numerals and illustrated, for example, through the attached drawings showing the similar components are not limited to. 도 1은 본 발명의 하나의 실시예에 따른 멀티모달 통신 시스템의 하나의 예를 예시하는 블록도이다. 1 is a block diagram illustrating an example of a multimodal communication system in accordance with one embodiment of the invention. 도 2는 본 발명의 하나의 실시예에 따른 멀티모달 통신에 대한 방법의 하나의 예를 예시하는 플로우 차트이다. 2 is a flow chart illustrating one example of a method for multimodal communication in accordance with one embodiment of the present invention. 도 3은 본 발명의 하나의 실시예에 따른 멀티모달 통신에 대한 방법의 하나의 예를 예시하는 플로우 차트이다. 3 is a flow chart illustrating one example of a method for multimodal communication in accordance with one embodiment of the present invention. 도 4는 본 발명의 하나의 실시예에 따라 수신된 동시 멀티모달 입력 정보를 퓨징(fuse)하기 위한 방법의 하나의 예를 예시하는 플로우 차트이다. 4 is a flow chart illustrating one example of a method for fusing a single embodiment (fuse) the received concurrent multimodal input information according to the embodiment of the present invention. 도 5는 본 발명의 실시예에 따른 멀티모달 네트워크 요소의 하나의 예를 예시하는 블록도이다. Figure 5 is a block diagram illustrating an example of a multimodal network element according to an embodiment of the invention. 도 6은 본 발명의 하나의 실시예에 따른 멀티모달 세션 지속성을 유지하기 위한 방법의 하나의 예를 예시하는 플로우 차트이다. 6 is a flow chart illustrating one example of a method for maintaining a multimodal session persistence, according to one embodiment of the invention. 도 7은 도 6에 도시된 플로우 차트의 일부를 예시하는 플로우 차트이다. 7 is a flow chart illustrating a portion of a flow chart shown in Fig. 도 8은 본 발명의 하나의 실시예에 따른 동시 멀티모달 세션 상태 메모리 컨텐트의 하나의 예를 표시하는 블록도이다. 8 is a block diagram that shows an example of the concurrent multimodal session status memory content according to one embodiment of the invention. 요약하면, 멀티모달 네트워크 요소는 하나 이상의 디바이스 상에서 다른 사용자 에이전트 프로그램을 통해 동시 멀티모달 통신 세션을 용이하게 한다. In summary, the multimodal network element to facilitate the concurrent multimodal communication session with another user agent program on one or more devices. 예를 들면, 스피치 엔진 및 호출/세션 종료를 포함하는 음성 게이트웨이의 음성 브라우저와 같이 음성 모드로 통신하는 사용자 에이전트 프로그램이 모바일 디바이스 상에서 그래픽 브라우저와 같이 다른 모달리티로 동작하는 다른 사용자 에이전트 프로그램과 동기화된다. For example, as with the voice browser in a voice gateway comprises a speech engine and the call / session ends the user agent programs that communicate in the voice mode is synchronized with the different user agent programs that operate in different modalriti as graphical browser on a mobile device. 복수의 사용자 에이전트 프로그램이 세션 동안에 컨텐트 서버와 동작가능하게 결합되어 동시 멀티모달 인터액션을 가능하게 한다. A plurality of user agent programs is operatively coupled to the content server during the session allows for simultaneous multi-modal interaction. 멀티모달 네트워크 요소는 예를 들면 테스트 모드와 연관된 HTML 양식과 음 성 모드와 연관된 보이스XML 양식과 같이, 다른 모드들과 연관된 다른 마크업 언어 양식을 획득하는 것과 같이, 서로에 대해 상이한 모달리티로 동작하는 복수의 사용자 에이전트 프로그램에 대한 모달리티 특정 명령을 획득한다. Multimodal network element is, for example, such as Voice XML form associated with the HTML form and the voice mode associated with test mode, such as to obtain a different mark-up language forms associated with different modes, which operate at a different modalriti relative to one another to obtain modalriti specific commands for the plurality of user agent programs. 멀티모달 네트워크 요소는 세션 동안에 사용자에 대한 복수의 사용자 에이전트 프로그램으로부터의 출력을 획득된 모달리티 특정 명령에 기초하여 동기화한다. Multimodal network element is synchronized based on the obtained output from the plurality of user agent programs for the user during the session modalriti specific command. 예를 들면, 음성 브라우저는 하나의 디바이스 상에서 오디오를 출력하도록 동기화되고 그래픽 브라우저는 동일하거나 또는 다른 디바이스 상에서 스크린 상에 표시를 출력하도록 동기화되어, 하나 이상의 사용자 에이전트 프로그램을 통해 사용자 입력을 동시에 수행하도록 허용한다. For example, the voice browser will allow synchronization to output the audio on a single device and a graphical browser may be the same or on a different device is synchronized to output displayed on the screen, through the at least one user agent program to perform a user input at the same time do. 사용자가 다른 모달리티로 동작하고 있는 복수의 사용자 에이전트 프로그램을 통해 입력 정보를 입력하는 경우, 동시에 다른 멀티모달 정보에 대한 요구에 응답하여, 사용자에 의해 입력되고 복수의 사용자 에이전트 프로그램으로부터 전송된 수신된 동시 멀티모달 입력 정보를 퓨징하거나 링크한다. If a user enters input information through a plurality of user agent programs that operate in different modalriti, at the same time in response to a request for the other multi-modal information, is input by the user received transmission from the plurality of user agent programs simultaneously the fused or linked to the multi-modal input information. 그러한 것으로서, 동시 멀티모달 입력은 다른 사용자 에이전트 프로그램을 통해 활용되어, 다중 디바이스 또는 다른 디바이스들이 동시 멀티모달 세션 동안에 이용되거나 또는 복수의 사용자 에이전트 프로그램을 채용하는 하나의 디바이스에서 이용될 수 있다. As such, the concurrent multimodal input are utilized by the different user agent programs, it can be used in a device for multiple devices, or other devices used during the concurrent multimodal session, or employing a plurality of user agent programs. 다른 프록시는 멀티모달 네트워크 요소에 의해 다른 모달리티로 설정된 다른 사용자 에이전트 프로그램 각각과 통신하도록 설계된다. Other proxy is designed to communicate with different user agent programs each set to a different modalriti by the multimodal network element. 도 1은 본 발명의 하나의 실시예에 따른 멀티모달 통신 시스템(10)의 하나의 예를 예시하고 있다. 1 illustrates one example of a multimodal communication system 10 according to one embodiment of the invention. 본 예에서, 멀티모달 통신 시스템(10)은 통신 디바이스(12), 멀티모달 퓨젼 서버(14), 음성 게이트웨이(16), 및 웹 서버(18)와 같은 컨텐트 소 스를 포함한다. In this example, the multimodal communication system 10 includes a content source, such as the communication device 12, a multimodal fusion server 14, the voice gateway 16, and the web server 18. 통신 디바이스(12)는 예를 들면, 인터넷 가전, PDA, 셀룰러 전화기, 케이블 셋탑 박스, 텔레메틱스 유닛, 랩탑 컴퓨터, 데스크탑 컴퓨터, 또는 임의의 다른 이동형 또는 비이동형 디바이스일 수 있다. Communications device 12 may be, for example, Internet home appliance, PDA, cellular telephone, a cable set-top box, a telematics unit, a laptop computer, a desktop computer, or any other portable or non-portable devices. 원하는 통신 타입에 따라, 통신 디바이스(12)는 무선 로컬 영역 또는 와이드 영역 네트워크(20), WAP/데이터 게이트웨이(22), 짧은 메시징 서비스 센터(SMSC/페이징 네트워크)(24), 또는 임의의 다른 적절한 네트워크와 동작가능한 통신 상태에 있을 수 있다. In accordance with the desired communication type, the communication device 12 is a wireless local area or wide area network (20), WAP / data gateway 22, a short messaging service center (SMSC / paging network) 24, or any other suitable It may be in the network and the operable state. 마찬가지로, 멀티모달 퓨젼 서버(14)는 인터넷, 인트라넷, 멀티미디어 서버(MMS, 26), 인스턴트 메시징 서버(IMS, 28), 또는 임의의 다른 적절한 네트워크를 포함하는 임의의 적합한 디바이스, 네트워크 요소 또는 네트워크와 통신 상태에 있을 수 있다. Similarly, the multimodal fusion server 14 is the Internet, an intranet, a multimedia server (MMS, 26), the instant messaging server (IMS, 28), or any suitable device, including any other suitable networks, network elements or networks and It may be in the communication state. 따라서, 통신 디바이스(12)는 통신 링크(21, 23 및 25)를 통해 적절한 네트워크와 동작가능한 통신 상태에 있다. Accordingly, the communication device 12 is in communication with the appropriate network available operating over a communication link (21, 23, and 25). 마찬가지로, 멀티모달 퓨전 서버(14)는 참조부호 27로 지정된 종래 통신 링크를 통해 다양한 네트워크에 적절하게 링크될 수 있다. Similarly, the multimodal fusion server 14 may be appropriately linked to the network through a variety of conventional communication links designated by reference numeral 27. 본 예에서, 음성 게이트웨이(16)는 음성 인식 엔진, 수서 문자인식 엔진, 안면 인식 엔진, 세션 컨트롤, 사용자 준비 알고리즘, 및 동작 및 유지보수 컨트롤러를 원하는 대로 포함할 수 있고, 이들로 제한되지 않는다. In this example, the voice gateway 16 may include as desired a speech recognition engine, handwriting character recognition engine, the face recognition engine, session control, user provisioning algorithm, and operations and maintenance controller, not limited to these. 본 예에서, 통신 디바이스(12)는 예를 들면 전화 회로(32)로서 도시된 마이크로폰 및 스피커를 포함하는 전화 회로와 함께, WAP 브라우저, 몸짓 인식, 촉각 인식 또는 임의의 다른 적절한 브라우저 형식의 가시적 브라우저(예를 들면, 그래픽 브라우저)와 같은 사용자 에이전트 프로그램(30)을 포함한다. In this example, the communication device 12, for example, with the telephone circuit comprising a microphone and a speaker shown as a telephone circuit (32), WAP browser, gesture recognition, touch recognition or any other suitable browser type of the visual browser It includes a user agent program 30, such as (e.g., a graphical browser). 임의의 다른 적절한 구성도 이용될 수 있다. Any other suitable configuration may be used. 음성 게이트웨이(16)는 전화 회로(32)의 스피커에 의한 출력을 위해 오디오 정보를 적절한 형태로 출력하는 음성 브라우저와 같은 다른 사용자 에이전트 프로그램(34)을 포함한다. Voice Gateway 16 includes the other user agent program 34, such as a voice browser for outputting audio information into a form suitable for output by the speaker of the telephone circuit (32). 스피커는 페이저 또는 다른 PDA와 같이 통신 디바이스(12)와는 다른 디바이스 상에 배치되어, 오디오는 하나의 디바이스 상에 출력되고 사용자 에이전트 프로그램(30)을 통한 가시 브라우저는 또 다른 디바이스 상에 제공되는 것을 알 수 있다. Speaker pager or are disposed on a different device than the communication device 12, as with the other PDA, the audio is seen that the visible browser is output on one of the device through the user agent program 30 is provided on the another device can. 또한, 사용자 에이전트 프로그램(34)이 음성 게이트웨이(16) 내에 존재하지만, 사용자 에이전트 프로그램(34)은 통신 디바이스(12, 음성 브라우저(36)로서 도시됨) 또는 임의의 다른 적절한 디바이스 내에 포함될 수도 있다는 것은 자명하다. In addition, the user agent program 34 is present in the voice gateway 16, however, the user agent program 34 (shown as 12, the voice browser 36), the communication device or not there may be included in any other suitable device it is self-evident. 여기에 설명된 바와 같이, 동시 멀티모달 통신을 수용하기 위해서는, 복수의 사용자 에이전트 프로그램, 즉 사용자 에이전트 프로그램(30) 및 사용자 에이전트 프로그램(40)이 주어진 세션에서 서로에 대해 다른 모달리티로 동작한다. In order to accommodate this the concurrent multimodal communication, as described, it operates in the other modalriti relative to each other in the plurality of user agent programs, that is, the user agent program 30 and the user agent program 40 is given session. 따라서, 사용자는 개시된 서비스에 대해 참가하여 웹 서버(18) 또는 임의의 다른 서버(MFS(14)를 포함함)를 통해 액세스 가능한 모달리티 선호도 데이터베이스(36)에 모달리티 선호도를 미리 설정함으로써, 각 사용자 에이전트 프로그램의 모드를 선정할 수도 있다. Accordingly, the user is to participate to the disclosed service web server 18 or by pre-setting the modalriti preferences in accessible modalriti preference database 36 via (including MFS (14)), any other server, and each user agent You may select the mode of the program. 또한, 원한다면, 사용자는 본 기술분야에 주지되어 있는 바와 같이, 세션 동안에 주어진 사용자 에이전트 프로그램의 모달리티를 선택하거나, 또는 변경할 수도 있다. In addition, if desired, the user may select modalriti a given user agent programs during a session, or may be changed as is known in the art. 동시 멀티모달 동기화 조정기(42)는 나머지 사용자 에이전트 프로그램에 대한 모달리티-특정 명령들에 연관된 통신 지연을 보상하기 위해, 복수의 사용자 에이전트 프로그램 중 하나에 대한 모달리티-특정 명령을 세션 동안에 일시적으로 저장하기 위한 버퍼 메모리를 포함할 수 있다. Concurrent multimodal synchronization coordinator 42 may rest a user agent modalriti for the program to compensate for communication delays associated with certain commands, modalriti for one of the plurality of user agent programs - for temporarily storing the specific command session while It may include a buffer memory. 그러므로, 예를 들면, 필요한 경우 에, 동기화 조정기(42)는 시스템 지연 또는 다른 지연을 고려하고 대기하여 모달리티-특정 명령을 프록시에 출력함으로써 이들이 다른 사용자 에이전트 프로그램 상에서 동시에 렌더링된다. Thus, for example, if necessary, synchronization regulator 42 in consideration of the system delay or other delays may be waiting modalriti - is by outputting a certain command to the proxy render them concurrently on different user agent programs. 또한, 원하는 경우, 사용자 에이전트 프로그램(30)은 입력 인터페이스를 제공하여 사용자가 특정 멀티-모드를 침묵하게 할 수 있도록 허용할 수 있다. In addition, by providing, if desired, the user agent program 30 includes an input interface a user-specific multi-may allow to silence mode. 예를 들면, 디바이스 또는 사용자 에이전트 프로그램이 다중 모드 동작을 허용하는 경우, 사용자는 특정 지속기간 동안에 모드가 침묵되도록 지시할 수 있다. For example, if the device or the user agent program allows the multi-mode operation, the user may indicate that the mode is silence during a certain duration. 예를 들면, 사용자에 대한 출력 모드가 음성이지만 사용자가 있는 환경이 시끄러운 경우, 사용자는 예를 들면 그 음성 브라우저에 출력을 침묵하도록 할 수 있다. For example, when the output mode of the user's voice, but a noisy environment in which the user, the user can, for example, to silence the output to the voice browser. 사용자로부터 수신되는 멀티-모드 침묵 데이터는 예를 들면 메모리(602, 도 5 참조)내에 멀티모달 퓨젼 서버(14)에 의해 저장되어, 주어진 세션 동안에 어느 모달리티가 침묵되어야 할지를 나타낸다. Multi received from a user-mode silence data is stored by the memory, for example the multimodal fusion server 14 in (602, see FIG. 5), which indicates whether the modalriti be silent in a given session. 그리고나서, 동기화 조정기(42)는 침묵하기로 식별된 이들 모달리티들에 대해 모달리티-특정 명령을 획득하는 것을 금지할 수 있다. Then, the synchronization regulator 42 is modalriti for the identification of these modalriti to silence - may prohibit acquisition of the specific command. 정보 페처(46, fetcher)는 복수의 사용자 에이전트 프로그램(30, 34)을 위한 멀티모드 어플리케이션(54)으로부터 모달리티-특정 명령(69)을 얻는다. Information fetcher (46, fetcher) is modalriti from the multimode application 54 for the plurality of user agent programs 30 and 34 - to obtain the specific command (69). 모달리티-특정 명령(68, 70)은 사용자 에이전트 프로그램(30, 34)에 전송된다. Modalriti-specific commands 68, 70 are transmitted to the user agent programs 30 and 34. 본 실시예에서, 멀티모드 어플리케이션(54)은 다른 사용자 에이전트 프로그램, 즉 이하에 설명되는 다른 모달리티와 연관된 모달리티 특정 명령을 식별하는 데이터를 포함한다. In this embodiment, the multimodal application 54 may include data that identifies the particular command associated with the other modalriti modalriti described another user agent program, that is, below. 동기 멀티모달 동기화 조정기(42)는 정보 페처(46)에 동작가능하게 결합되어 모달리티-특정 명령을 수신한다. Synchronous multimodal synchronization coordinator 42 is operatively coupled to the information fetcher 46 modalriti - receives a specific instruction. 동시 멀티모달 동기화 조정기(42)는 또한 복수의 프 록시(38a - 38n)에 동작가능하게 결합되어 주어진 세션에 필요한 이들 프록시를 지정한다. Concurrent multimodal synchronization coordinator 42 is also a plurality of proxy-be operatively coupled to (38a 38n) specifies these proxies required for a given session. 다른 사용자 에이전트 프로그램(30, 34)이 다른 디바이스 상에 존재하는 경우, 방법은 하나의 디바이스에 제1 모달리티-기반 마크업 언어 형식을 전송하고 제2 모달리티 마크업 언어-기반 형식을 하나 이상의 다른 디바이스에 전송하여 동일한 세션 동안에 다른 디바이스로부터 정보의 동시 엔트리를 사용자에 의해 다른 모달리티로 요구함으로써, 동시 멀티모달 입력 정보(67, 70)에 대한 요구를 전송하는 것을 포함한다. When another user agent program (30, 34) are present on the other device, the method first modalriti a single device-based markup transfer the language format and the second modalriti markup language - at least one other device based format by sending a request by it involves the concurrent entry of the information from other devices during the same session to a different modalriti by the user, and sends a request for concurrent multimodal input information (67, 70). 이들 마크업 언어-기반 형식은 모달리티-특정 명령(68, 70)으로서 얻어졌다. The markup language-based format modalriti - were obtained as a particular instruction (68, 70). 멀티모달 세션 컨트롤러(40)는 인커밍 세션을 검출하고, 세션에 응답하며, 세션 파라미터를 변형하고, 세션을 종료하며 디바이스 상의 세션 제어 알고리즘으로 세션 및 미디어 정보를 교환하는데 이용된다. Multimodal session controller 40 which detects an incoming session, and the session response, the modified session parameters, and ends the session, and is used to exchange session and media information in the session control algorithms on the device. 멀티모달 세션 컨트롤러(40)는 원하는 경우 세션에 대한 주 세션 종료 포인트일 수 있고, 사용자가 예를 들면 멀티모달 세션 컨트롤러(40)와 세션을 확립하는 음성 게이트웨이와 같은 다른 게이트웨이와 세션을 확립하기를 원하는 경우에, 제2 세션 종료 포인트일 수 있다. Multimodal session controller 40 is to establish a different gateway and a session such as a voice gateway to establish may be a week session termination point for the desired case the session, and the user, for example the multimodal session controller 40, the session If desired, a second session can be the end point. 동기화 조정기는 동시 멀티모달 입력 정보에 대한 요구를 포함하는 출력 동기화 메시지(47, 49)를 각 프록시(38a, 38n)에 전송하여, 그 출력을 복수의 에이전트 프로그램 각각에 유효하게 동기화한다. Synchronization regulator may send the output synchronization message (47, 49) including a request for concurrent multimodal input information, each proxy (38a, 38n), is effectively synchronized to the respective output of the plurality of agent programs. 프록시(38a, 38n)는 수신된 멀티모달 입력 정보(72, 74)를 포함하는 입력 동기화 메시지(51, 53)를 동시 동기화 조정기(42)에 전송한다. And it transmits to the proxy (38a, 38n) includes an input synchronization message containing the received multimodal input information 72 and 74 (51, 53) the simultaneous synchronization regulator 42. 동시 멀티모달 동기화 조정기(42)는 프록시, 또는 사용자 에이전트 프로그램이 성능을 가지고 있는 경우에 사용자 에이전트 프로그램으로 동기화 메시지(47, 49, 51 및 53)를 전송하고 수신한다. Concurrent multimodal synchronization coordinator 42 transmits a proxy, or a user agent program, the synchronization message (47, 49, 51 and 53) to the user agent program if it has the capabilities to receive. 프록시(38a 및 38n)가 다른 사용자 에이전트 프로그램으로부터 수신된 멀티모달 입력 정보(72 및 74)를 수신하는 경우, 프록시는 수신된 멀티모달 입력 정보(72 및 74)를 포함하는 입력 동기화 메시지(51 및 53)를 동기화 조정기(42)에 전송한다. When receiving the proxy (38a and 38n) is a multimodal input information 72 and 74 received from the other user agent program, the proxy input the synchronization message containing the received multimodal input information 72 and 74 (51 and 53) to transmit the synchronization regulator 42. 동기화 조정기(42)는 수신된 정보를 멀티모달 퓨젼 엔진(44)에 포워딩한다. Synchronization coordinator 42 forwards the received information to the multimodal fusion engine 44. 또한, 사용자 에이전트 프로그램(34)이 동기화 메시지를 멀티모달 동기화 조정기(42)에 전송하는 경우, 멀티모달 동기화 조정기(42)는 동기화 메시지를 세션 내에서 다른 사용자 에이전트 프로그램(30)에 전송한다. Further, when the user agent program 34 transmits a synchronization message to the multimodal synchronization coordinator 42, the multimodal synchronization coordinator 42 sends a synchronization message in the session to the other user agent program 30. 동시 멀티모덜 동기화 조정기(42)는 메시지 변환, 동기화 메시지 필터링을 수행하여, 동기화 시스템을 더 효율적으로 만든다. Simultaneous multi-modal synchronization regulator 42 to perform message conversion, synchronization, message filtering, and make the synchronization system more efficient. 동시 멀티모달 동기화 조정기(42)는 주어진 세션에서 이용되는 현재 사용자 에이전트 프로그램의 리스트를 유지하여, 동기화가 필요한 경우에 통지될 필요가 있는 것들을 추적한다. Concurrent multimodal synchronization coordinator 42 is to maintain a list of the current user-agent program to be used in a given session, and tracking things that need to be notified in the case where synchronization is required. 멀티모달 퓨젼 서버(14)는 복수의 멀티모달 프록시(38a-38n), 멀티모달 세션 컨트롤러(40), 동시 멀티모달 동기화 조정기(42), 멀티모달 퓨젼 엔진(44), 정보(예를 들면, 모달리티 특정 명령) 페처(46), 및 음성XML 해석기(50)를 포함한다. The multimodal fusion server 14 is, for a plurality of multimodal proxies (38a-38n), the multimodal session controller 40, concurrent multimodal synchronization coordinator 42, the multimodal fusion engine 44, the information (for example, modalriti and a specific command) prefetcher 46, and a voice XML interpreter 50. 적어도 멀티모달 세션 컨트롤러(40), 동시 멀티모달 동기화 조정기(42), 멀티모달 퓨젼 엔진(44), 정보 페처(46), 및 멀티모달 마크업 언어(예를 들면, 음성XML) 해석기(50)는 하나 이상의 처리 디바이스 상에서 실행되는 소프트웨어 모듈로서 구현될 수 있다. At least multimodal session controller 40, concurrent multimodal synchronization coordinator 42, the multimodal fusion engine 44, the information fetcher 46, and the multimodal markup language (e. G., Voice XML) interpreter (50) It may be implemented as software modules running on one or more processing devices. 그러한 것으로서, 하나 이상의 처리 디바이스에 의해 판독될 때 하나 이상의 처리 디바이스가 각 소프트웨어 모듈과 관련하여 여기에 기재된 기능들을 수행하도록 유발하는 실행가능한 명령을 포함하는 메모리가 개시된다. As such, a memory is disclosed, which when read by at least one processing device is at least one processing device comprising executable instructions that cause so with respect to each software module performing the functions described herein. 그러므로, 멀티모달 퓨젼 서버(14)는 디지털 신호 처리기, 마이크로컴퓨터, 마이크로프로세서, 상태 머신, 또는 임의의 다른 적절한 처리 디바이스를 포함하고, 이들로 제한되지 않는 처리 디바이스를 포함한다. Thus, the multimodal fusion server 14 comprises a digital signal processor, microcomputer, microprocessor, state machine, or process that does not include any other suitable processing device, limited to these devices. 메모리는 처리 디바이스에 의해 실행될 때 하나 이상의 처리 디바이스가 여기에 기재된 대로 동작하도록 유발하는 상태 또는 다른 데이터를 저장하는 ROM, RAM, 분산 메모리, 플래시 메모리, 또는 임의의 다른 적절한 메모리일 수 있다. The memory may be, when executed by a processing device, ROM, RAM, a distributed memory, for storing state, or other data that cause one or more processing devices to operate as described herein a flash memory, or any other suitable memory. 다르게는, 소프트웨어 모듈의 기능들은 하드웨어, 또는 하드웨어, 소프트웨어 및 펌웨어의 원하는 대로의 임의의 적절한 조합으로 구현될 수 있다. Alternatively, the functions of the software modules may be implemented in hardware, or in hardware, software, and any suitable combination of the firmware as desired. 멀티모달 마크업 언어 해석기(50)는 특히 멀티모달 어플리케이션(54)에 의해 제공되는 마크업 언어를 실행하는 상태 머신 또는 다른 적절한 하드웨어, 소프트웨어, 펌웨어 또는 이들의 임의의 적절한 조합일 수 있다. Multimodal markup language interpreter 50 may in particular be run markup language provided by the multimodal application 54 state machine or other suitable hardware, software, firmware, or any suitable combination of these to. 도 2는 본 예에서, 멀티모달 퓨젼 서버(14)에 의해 실행되는 멀티모달 통신을 위한 방법을 예시하고 있다. Figure 2 illustrates a method for multimodal communication is executed by the present embodiment, the multimodal fusion server 14. 그러나, 여기에 기재된 임의의 단계들은 임의의 적절한 순서로 임의의 적절한 디바이스 또는 복수의 디바이스들에 의해 실행될 수 있다는 것은 자명하다. However, any of the steps described herein are obvious that it can be run by any suitable device or plurality of devices in any suitable order. 현재의 멀티모달 세션에 대해, 사용자 에이전트 프로그램(30, 예를 들면 WAP 브라우저)은 요구(52)를 웹 서버(18)에 전송하여 웹 서버(18)에 의해 액세스가능한 동시 멀티모달 어플리케이션(54)으로부터 컨텐트를 요구한다. For the current multimodal session, the user agent program (30, for example a WAP browser) will require 52, a possible concurrent multimodal application 54 is accessed by the Web server, the Web server 18 sends to 18 from requires the content. 이것은 URL에 타이핑하거나 아이콘을 클릭하거나 또는 임의의 다른 관례적인 메커니즘을 이용하여 수행될 수 있다. This may be a typing or clicking the icon in the URL, or performed using any of the other customary mechanisms. 점선(52)에 의해 도시된 바와 같이, 각 사용자 에이전트 프로그램(30, 34)은 사용자 모달리티 정보를 마크업 해석기(50)에 전송할 수 있다. The respective user agent programs 30 and 34 as shown by the dotted line 52 may transmit the information to the user modalriti markup interpreter 50. 컨텐트 서버로서 기능하는 웹 서버(18)는 사용자 가입 프로세스를 통해 동시 멀티모달 서비스에 이전에 가입한 모달리티 선호도 데이터베이스(36)로부터 통신 디바이스(12)의 멀티모달 선호도(55)를 얻는다. The web server 18 which functions as a content server to obtain a multimodal preferences 55 of the communication device 12 from a modalriti preference database (36) join prior to the concurrent multimodal service through the user subscription process. 그리고나서, 웹 서버(18)는 데이터베이스(36)로부터 사용자 선호도를 포함하는 통지(56)를 통해 멀티모달 퓨젼 서버(14)에 통지하고, 예를 들면 동시 멀티모달 통신에서 어느 사용자 에이전트 프로그램이 이용되고 있는 지와 각 사용자 에이전트 프로그램이 어느 모드로 설정되어 있는지를 나타낸다. Then, the Web server 18 is any user-agent program used in a simultaneous multi-modal communication, for the notification, and for example, the multimodal fusion server 14 via the notification (56) including a user preference from the database (36) the paper and each of the user agent programs that are set to indicate whether any mode. 본 예에서, 사용자 에이전트 프로그램(30)은 텍스트 모드로 설정되고, 사용자 에이전트 프로그램(34)은 음성 모드로 설정된다. In this example, the user agent program 30 is set as the text mode, the user agent program 34 is set to the voice mode. 그리고나서, 동시 멀티모드 동기화 조정기(42)는 세션 동안에 각 사용자 에이전트 프로그램(30 및 34)에 복수의 멀티모달 프록시(38a-38n) 중 어느 것이 이용되는지를 결정한다. Then, the concurrent multimode synchronization coordinator 42 determines which one is used during each session of the user agent programs 30 and 34 a plurality of multimodal proxies (38a-38n) to. 그러한 것으로, 동시 멀티모드 동기화 조정기(42)는 멀티모드 프록시(38a)를 텍스트 프록시로 지정하여, 텍스트 모드로 설정된 사용자 에이전트 프로그램(30)과 통신한다. As such, concurrent multimodal synchronization coordinator 42 by specifying the multi-mode proxy (38a) to the proxy text, it communicates with the user agent program 30 is set to the text mode. 마찬가지로, 동시 멀티모드 동기화 조정기(42)는 프록시(38n)를 멀티모드 프록시로서 지정하여, 음성 모달리티로 동작하고 있는 사용자 에이전트 프로그램(34)에 대해 음성 정보를 통신한다. Similarly, the simultaneous multi-mode synchronization regulator 42 is to specify a proxy (38n) as a multi-mode proxy, communicates the voice information to a voice modalriti user agent that is operating as a program (34). 웹 페이지 페처(46)로서 도시된 정보 페처는 동시 멀티모달 어플리케이션(54)과 연관된 웹 서버(18)로부터 마크업 언어 형식 또는 다른 데이터와 같은 모달리티 특정 명령을 얻는다. The information fetcher shown as a Web page fetcher 46 obtains the modalriti specific commands, such as a markup language format, or other data from a web server (18) associated with the concurrent multimodal application 54. 예를 들면, 멀티모달 어플리케이션(54)이 사용자에게 음성 모드 및 텍스트 모드 양쪽으로 정보를 입력하도록 요구하는 경우, 정보 페처(46)는 연관된 HTML 마크업 언어 형식을 얻어, 사용자 에이전트 프로그램(30)에 대해 출력하고 연관된 음성XML 형식을 얻어 요구(66)를 통해 사용자 에이전트 프로그램(34)에 출력한다. For example, the multimodal application 54. In this case, requiring the user to enter the information in both the voice mode and a text mode, the information fetcher 46 obtains the associated HTML mark-up language format, the user agent program 30 voice XML output format, and outputs the obtained associated for the user agent program 34 via the request (66). 그리고나서, 이들 모달리티 특정 명령들은 사용자 에이전트 프로그램에 의해 출력으로서 렌더링된다(예를 들면, 스크린 또는 스피커를 통해 출력된다). Then, these modalriti specific commands are rendered as an output by the user agent program (for example, is output through the screen or speaker). 동시 멀티모달 동기화 조정기(42)는 세션 동안에 모달리티 특정 명령에 기초하여 복수의 사용자 에이전트 프로그램(30 및 34)으로부터 출력을 동기화한다. Concurrent multimodal synchronization coordinator 42 synchronizes the output from the plurality of user agent programs 30 and 34 on the basis of the modalriti specific command during a session. 예를 들면, 동시 멀티모달 동기화 조정기(42)는 다른 모달리티를 나타내는 적절한 마크업 언어 형식을 적절한 시간에 각 사용자 에이전트 프로그램(30 및 34)에 전송하여, 음성이 통신 디바이스(12) 상에서 렌더링될 때 텍스트가 사용자 에이전트 프로그램(30)을 통해 스크린 상에 출력되어 동시에 렌더링된다. For example, concurrent multimodal synchronization coordinator 42 will send the appropriate mark-up language format showing another modalriti each user agent programs 30 and 34 at the appropriate time, when the speech is rendered on the communication device 12 text is output on the screen via the user agent program 30 is rendering at the same time. 예를 들면, 멀티모달 어플리케이션(54)은 텍스트 브라우저를 통해 어떤 정보가 입력될 것인지에 관해 사용자에게 사용자 에이전트 프로그램(34)을 통해 가청 명령의 형태로 명령을 제공하고, 그 동안에 동시에 사용자 에이전트 프로그램(30)으로부터의 텍스트 입력을 기다린다. For example, the multimodal application 54 may provide a command in the form of an audible command through the user agent program 34 to the user about whether any information is inputted through the text browser, and in the meantime, at the same time a user agent program (30 ) awaits a text input from the. 예를 들면, 멀티모달 어플리케이션(54)은 "please enter your desired destination city followed by your departure time"이라는 단어들의 음성 출력을 요구하면서, 동시에 도시에 대해 "C"로서 지정된 필드 및 목적지에 대해 다음 라인에 "D"로서 지정된 필드로 통신 디바이스 상의 디스플레이 상에 출력되는 사용자 에이전트 프로그램(30)을 통해 필드를 제공한다. For example, the multimodal application 54, requiring a voice output of the word "please enter your desired destination city followed by your departure time", at the same time as "C" for showing the next line for the given field and a destination provides a field through the user agent program 30 is output on a display on the communication device to the given field as a "D". 본 예에서, 멀티모달 어플리케이션은 사용자에 의해 동시 멀티모달 입력을 요구하지 않고, 하나의 모드 즉 텍스트 모드를 통한 입력만을 요구하고 있다. In this example, the multimodal application without requiring the concurrent multimodal input by the user, requiring only a single mode that is input through the text mode. 다른 모드는 사용자 명령들을 제공하는데 이용되고 있다. Other modes can be used to provide a user command. 다르게는, 멀티모달 어플리케이션(54)이 사용자가 복수의 사용자 에이전트 프로그램을 통해 입력 정보를 입력하라고 요구하는 경우, 멀티모달 퓨젼 엔진(14)은 세션 동안에 다른 멀티모달 사용자 에이전트 프로그램에 동시에 입력되는 사용자 입력을 융합시킨다. Alternatively, the multimodal application 54 if the demanded that the user enters the input information over a plurality of user agent programs, the multimodal fusion engine 14 is a user input at the same time to another multi-modal user agent programs during a session It is fused to. 예를 들면, 사용자가 가시적인 지도 상에서 2개의 지점을 클릭하면서 "directions from here to there"의 단어들을 말하는 경우, 음성 브라우저 또는 사용자 에이전트 프로그램(34)은 수신된 입력 정보(74)로서 시작 위치 필드를 "here"로 채우고, 목적지 위치 필드를 "there"로 채우며, 그 동안에 그래픽 브라우저, 즉 사용자 에이전트 프로그램(30)은 시작 위치 필드를 지도 상의 제1 클릭 지점의 지리적 위치(예를 들면, 위도/경도)로 채우고, 목적지 위치 필드를 지도 상의 제2 클릭 지점의 지리적 위치(예를 들면, 위도/경도)로 채운다. For example, in the case, while the user clicks two points on the visible map speaking the words of "directions from here to there", the voice browser or user agent program 34 is started as the received input information 74, location field to fill the "here", it fills the destination location field with "there", during which a graphical browser, that is, the user agent program 30 is, for the geographical location (for example, the first click point in the start position field map, latitude / fill the hardness), the destination position field, for the geographical location (for example, a second click point on the map, filled with a latitude / longitude). 멀티모달 퓨젼 엔진(44)은 이러한 정보를 얻어 다른 모달리티로 동작하고 있는 다수의 사용자 에이전트 프로그램으로부터 사용자에 의해 입력되는 입력 정보를 융합하고, 단어 "here"가 제1 클릭 지점의 지리적 위치에 대응하고 단어 "there"는 제2 클릭 지점의 지리적 위치(위도/경도)에 대응하는지를 결정한다. Multimodal fusion engine 44 is fused to the input information input by the user from the plurality of user agent programs that are operating this information to the other takes modalriti, and the word "here" corresponds to the geographical position of the first click point, and the word "there" is determined corresponding to whether the geographic location (latitude / longitude) of the second click point. 이와 같이, 멀티모달 퓨젼 엔진(44)은 사용자 명령의 완전한 정보 셋트를 가지고 있다. In this way, the multimodal fusion engine 44 may have a complete set of user command information. 멀티모달 퓨젼 엔진(44)은 사용자 에이전트 프로그램(30 및 34)이 동시 멀티모달 통신과 연관된 완전한 정보를 가질 수 있도록 융합된 정보(60)를 이들 사용자 에이전트 프로그램(30 및 34)에 다시 전송하기를 원한다. The multimodal fusion engine 44 is to re-transmit the convergence (60) to have the complete information associated with the user agent programs 30 and 34 are simultaneously multimodal communication in these user agent programs 30 and 34 want. 이 때, 사용자 에이전트 프로그램(30)은 이러한 정보를 컨텐트 서버(18)에 제출하여 원하는 정보를 얻는다. At this time, the user agent program 30 is to submit this information to the content server 18 to obtain the desired information. 블록 200에 도시된 바와 같이, 세션에 대해, 방법은 복수의 사용자 에이전트 프로그램 각각에 대해 각 모달리티에 특정된 마크업 언어의 다른 타입을 얻는 것과 같은 것에 의해, 서로에 대해 다른 모달리티로 동작하는 복수의 사용자 에이전트 프로그램에 대한 모달리티 특정 명령(68, 70)을 얻는 것을 포함한다. As it is shown in block 200, for the session, a plurality of by as obtaining a different type of mark-up language specific to each modalriti for each of the plurality of user agent programs operating in different modalriti relative to one another of It includes obtaining a modalriti specific command (68, 70) for the user agent program. 블록 202에 도시된 바와 같이, 방법은 사용자에 대해 동시 멀티모달 동작을 용이하게 하기 위해 모달리티-특정 명령에 기초하여 사용자 에이전트 프로그램과 같은 출력을 동기화하는 것을 포함한다. As it is shown in block 202, the method in order to facilitate simultaneous multi-modal motion for a user modalriti - include those based on the particular instruction to synchronize the output, such as user agent program. 그러한 것으로서, 마크업 언어 형식의 렌더링은 복수의 사용자 에이전트 프로그램으로부터의 출력이 복수의 사용자 에이전트 프로그램을 통해 다른 모달리티로 동시에 렌더링되도록 동기화된다. As such, the rendering of mark-up language format is synchronized so that the outputs from the plurality of user agent programs at the same time to render a different modalriti through the plurality of user agent programs. 블록 203에 도시된 바와 같이, 동시 멀티모달 동기화 조정기(42)는 다른 사용자 에이전트 프로그램(30 및 34)에 대한 모달리티 특정 명령(68, 70) 세트가 사용자에 의해 다른 사용자 에이전트 프로그램을 통해 다른 모달리티로 정보의 동시 입력을 요구할지를 결정한다. As shown in block 203, and simultaneously the multimodal synchronization coordinator 42 is a modalriti other modalriti certain commands (68, 70) set by the user via the other user agent program for another user agent program 30 and 34 It determines require a simultaneous input of information. 그렇지 않다면, 블록 205에 도시된 바와 같이, 동시 멀티모달 동기화 조정기(42)는 단지 하나의 사용자 에이전트 프로그램으로부터 지정 서버 또는 웹 서버(18)에 임의의 수신된 입력 정보를 포워딩한다. If not, as shown in block 205, concurrent multimodal synchronization coordinator 42 forwards any received input information to the specified server or the web server 18 from only a single user agent program. 그러나, 블록 204에 도시된 바와 같이, 다른 사용자 에이전트 프로그램(30, 34)에 대한 모달리티-특정 명령의 세트(68, 70)가 다른 모달리티에서 동시에 입력되는 사용자 입력을 요구하는 경우, 방법은 사용자가 입력하고 사용자 에이전트 프로그램(30 및 34)에 의해 재전송되는 수신된 동시 멀티모달 입력 정보를 융합하여 다른 모달리티로 동작하는 다른 사용자 에이전트 프로그램과 연관된 융합된 멀티모달 응답(60)을 생성한다. However, as shown in block 204, modalriti for another user agent program (30, 34) if a particular set of instructions (68, 70) requires a user input that is input at the same time in different modalriti, the method the user and input and generates the user agent programs 30 and 34 fused multimodal response 60 is associated with the other user agent program to fuse the received concurrent multimodal input information to another operation modalriti retransmitted by. 블록 206에 도시된 바와 같이, 방법은 융합된 멀티모달 응답(60)을 마크업 언어 해석기(50)의 현재 실행중인 어플리케이션(61)에 다시 포워딩하는 것을 포함한다. As shown in block 206, the method includes forwarding the re-fused multimodal response 60 to the currently running application (61) in a markup language interpreter (50). 현재 실행 중인 어플리케이션(61, 도 5 참조)은 해석기(50)의 일부로서 실행중인 어플리케이션(54)으로부터의 마크업 언어이다. The currently running application (see 61, FIG. 5) is a markup language from the application 54 that is running as a part of the interpreter 50. 도 1 및 3을 참조하면, 멀티모달 통신 시스템(10)의 더 상세한 동작이 설명된다. Referring to Figures 1 and 3, a more detailed operation of a multimodal communication system 10 will be described. 블록 300에 도시된 바와 같이, 통신 디바이스(12)는 사용자 에이전트 프로그램(30)을 통해 웹 컨텐트 또는 다른 정보에 대한 요구(52)를 전송한다. As shown in block 300, the communication device 12 via the user agent program 30 sends a request 52 for a web content, or other information. 블록 302에 도시된 바와 같이, 컨텐트 서버(18)는 식별된 사용자에 대한 모달리티 선호도 데이터베이스(36)로부터 멀티모달 선호도 데이터(55)를 얻음으로써, 세션에 대한 디바이스 선호도 및 모드 선호도를 알아낸다. As it is shown in block 302, the content server 18 by obtaining the multimodal preferences data 55 from modalriti preference database (36) for the identified user, and discover the device preference and mode preferences for the session. 블록 304에 도시된 바와 같이, 방법은 컨텐트 서버가 멀티모달 퓨젼 서버(14)에 어느 사용자 에이전트 어플리케이션이 주어진 동시 다른 멀티모달 통신 세션에 대해 어느 디바이스 상에서, 어떤 모드로 동작하고 있는지를 통지하는 것을 포함한다. As shown in block 304, the method may include notifying whether the content server to which the multimodal fusion server 14, the user agent application operating in any mode, on which the device for a given same time other multimodal communication session do. 상기 지적되고 블록 306에 도시된 바와 같이, 동시 멀티모달 동기화 조정기(42)는 모달리티 선호도 데이터베이스(36)로부터의 모달리티 선호도 정보(55)에 기초하여 각 다른 모달리티에 대해 각 프록시를 결정하도록 설정된다. As noted above and shown in block 306, the concurrent multimodal synchronization coordinator 42 it is set up to determine each proxy for each other modalriti based on modalriti preference information 55 from the modalriti preference database (36). 블록 308에 도시된 바와 같이, 방법은 원하는 경우에 멀티모달 세션 컨트롤러(40)를 통해 각 사용자 에이전트 프로그램에 대한 사용자 모드 지정을 수신하는 것을 포함한다. As shown in block 308, the method includes receiving a user mode specifying for each user agent program via the multimodal session controller 40, if desired. 예를 들면, 사용자는 원하는 모드를 변경하여 모달리티 선호도 데이터베이스(36)에 저장된 미리 설정된 모달리티 선호도(55)와 다르게 할 수 있다. For example, the user may be different from the modalriti preferences 55 stored in the preset modalriti preference database (36) by changing a mode. 이것은 관례적인 세션 메시징을 통해 수행될 수 있다. This can be done through the customary messaging session. 원하는 사용자 에이전트 프로그램이 다른 디바이스 상에 존재하는 경우와 같이, 사용자가 특정 사용자 에이전트 프로그램에 대해 원하는 모드를 변경했다면, 다른 마크업 언어 형식과 같이, 다른 모달리티-특정 명령이 요구된다. For example, if you want the user agent program resides on the other device, if the user changes the desired mode for a particular user agent programs, like any other markup language format, and the other modalriti - is required for a specific command. 사용자 모달리티 지정이 변경되는 경우, 정보 페처(46)는 사용자 에이전트 어플리케이션에 대한 선택된 모달리티에 기초하여 적절한 모달리티-특정 명령을 페치하고 요구한다. If the user specifies modalriti is changed, the information fetcher 46 is appropriate based on the selected modalriti modalriti for the user agent application-fetches a specific command requires. 블록 310에 도시된 바와 같이, 정보 페처(46)는 각 사용자 에이전트 프로그램 및 즉 각 모달리티에 대해 페치 요구(66)로서 도시된 컨텐트 서버(18)로부터의 모달리티 특정 명령을 페치한다. As shown in block 310, the information fetcher 46 fetches the modalriti specific commands from each user agent program and that is, the content server 18 is shown as a fetch request (66) for each modalriti. 그러므로, 정보 페처(46)를 통한 멀티모달 퓨젼 서버(14)는 다른 모달리티를 나타내는 마크업 언어를 획득하여, 각 사용자 에이전트 프로그램(30 및 34)은 마크업 언어에 기초하여 정보를 다른 모달리티로 출력할 수 있다. Thus, the multimodal fusion server 14 through the information fetcher 46 obtains a markup language representing different modalriti, each user agent programs 30 and 34 outputs information on the basis of the mark-up language to another modalriti can do. 그러나, 멀티모달 퓨젼 서버(14)는 단지 마크업 언어 기반 정보가 아니라, 또한 임의의 적합한 모달리티-특정 명령을 포함할 수 있다. However, as the multimodal fusion server 14 is just a markup language-based information, and any suitable modalriti may include specific commands. 모달리티-특정 명령이 각 사용자 에이전트 프로그램에 대해 컨텐트 서버(18)로부터 페치되고 어떠한 CMMT도 모달리티 특정 명령(68, 70)과 연관되지 않는 경우, 수신된 모달리티 특정 명령(69)이 트랜스코더(608, 도 5 참조)에 전송된다. Modalriti - a specific command is fetched from the content server 18 for each user agent program any CMMT FIG modalriti if it is not associated with a specific command (68, 70), the received modalriti specific instruction 69 is a transcoder (608, It is transferred to FIG. 5). 트랜스코더(608)는 수신된 모달리티 특정 명령을 해석기(50)에 의해 이해되는 베이스 마크업 언어 형식으로 트랜스코딩하고, 다른 모달리티(610)에 대해 모달리티 특정 명령을 식별하는 데이터를 가지는 베이스 마크업 언어 형식을 생성한다. The transcoder 608 receives the modalriti specific command transcoding a base markup language format that is understood by the parser 50, and having a modalriti data that identifies the specific command for the other modalriti 610 base markup language to create a form. 그러 므로, 트랜스코더는 모달리티 특정 명령을 트랜스코딩하여 다른 모달리티로 동작하는 또 하나의 사용자 에이전트 프로그램에 대한 모달리티 특정 명령을 식별하는 데이터를 포함한다. Since, however, the transcoder includes data identifying the particular command modalriti for another user agent program to transcode modalriti particular command operation to another modalriti. 예를 들면, 해석기(50)가 음성XML과 같은 베이스 마크업 언어를 이용하고 어플리케이션(54)으로부터의 모달리티 특정 명령의 하나의 세트가 음성XML로 되어 있고 나머지는 HTML로 되어 있는 경우, 트랜스코더(606)는 HTML 형식이 얻어질 수 있는 URL을 식별하는 음성XML 형식, 또는 실제의 HTML 형식 자체에 CMMT를 내장시킨다. For example, the analyzer 50 is that one set of modalriti specific command from the use of a base markup language and application 54, such as Voice XML is a voice XML, and if the remainder is in HTML, the transcoder ( 606) causes the CMMT built in voice XML format that identifies the URL in the HTML format can not be obtained, or the actual HTML format itself. 뿐만 아니라, 모달리티 특정 명령 중 어느 것도 베이스 마크업 언어로 되어 있지 않은 경우, 모달리티 특정 명령 세트가 베이스 마크업 언어로 번역되고, 그런 다음 모달리티 특정 명령의 다른 세트가 CMMT에 의해 참조된다. In addition, modalriti any of the specific command if it is not the base markup language, modalriti being translated into a specific set of instructions based markup language, then modalriti is referred to by a different set of specific commands is CMMT. 다르게는, 멀티모달 어플리케이션(54)은 필요한 CMMT 정보를 제공하여, 동시 멀티모달 세션 동안에 복수의 사용자 에이전트 프로그램에 의한 출력의 동기화를 용이하게 한다. Alternatively, the multimodal application 54 facilitates the synchronization of output by the plurality of user agent program to provide information CMMT necessary, during the concurrent multimodal session. 각 사용자 에이전트 프로그램에 대한 모달리티 특정 명령의 하나의 예가 마크업 언어 형식으로 이하에 도시되어 있다. There modalriti is shown below as one example of a markup language format of the specific command for each user agent program. 마크업 언어 형식은 멀티모달 어플리케이션(54)에 의해 제공되고 멀티모달 퓨젼 서버(14)에 의해 이용되어, 동시 멀티모달 통신 세션을 제공한다. Markup language format is provided by the multimodal application 54 and is used by the multimodal fusion server 14, and provides a simultaneous multimodal communication session. 멀티모달 음성XML 해석기(50)는 멀티모달 어플리케이션(54)이 베이스 언어로서 음성XML을 이용하는 것으로 가정한다. Multimodal Voice XML interpreter (50) is assumed to be multi-modal applications (54) using a voice XML-based language. 사용자에 대한 복수의 사용자 에이전트 프로그램에 의한 출력의 동기화를 용이하게 하기 위해, 멀티모달 어플리케이션(54)은 음성XML 형식의 확장이나 HTML 형식으로의 인덱스와 같은 동시 멀티모달 태그(CMMT)를 포함하거나 인덱스하도록 저작될 수 있다. In order to facilitate synchronization of output by the plurality of user agent programs for the user, the multimodal application 54 may include or index concurrent multimodal tag (CMMT) as the index of the expansion or HTML format for voice XML format to be authored. CMMT는 모달리티를 식별하고 식별된 모달리티에서 사용자 에이전트 프로그램 들 중 하나에 의해 출력되는 실제 HTML 형식과 같은 정보를 포인팅하거나 포함한다. CMMT is information such as the actual HTML format outputted by one of the user agent program on the identified modalriti the modalriti and identifying or pointing to include. CMMT는 또한 그 존재는 다른 사용자 에이전트 프로그램으로 다른 모달리티 특정 명령을 동기화할 필요성을 나타낸다는 점에서 멀티모달 동기화 데이터로서 기능한다. CMMT also shows that there is a need to synchronize the other modalriti particular command to another user agent program acts as a multimodal synchronization data points. 예를 들면, 음성XML이 멀티모달 어플리케이션(54)의 베이스 언어인 경우, CMMT는 텍스트 모드를 가리킬 수 있다. For example, if the speech is XML-based language of the multi-modal application (54), CMMT may point to a text mode. 본 예에서, CMMT는 사용자 에이전트 프로그램에 의해 출력된 HTML로 된 텍스트를 포함하는 URL을 포함하거나, CMMT의 일부로서 HTML을 포함할 수 있다. In this example, CMMT comprises a URL that contains the text to the HTML output by the user agent programs, or may include as part of the HTML CMMT. CMMT는 마크업 언어의 속성 확장자의 특성을 가질 수 있다. CMMT may have the characteristics of the property extension of the markup language. 멀티모달 음성XML 해석기(50)는 정보 페처(46)를 이용하여 모달리티 특정 명령을 페치하고, 멀티모달 어플리케이션으로부터의 페치된 모달리티 특정 명령을 분석하여(본 예에서는, 실행하여) CMMT를 검출한다. Multimodal Voice XML interpreter 50 fetches the modalriti specific commands by using the information fetcher 46, and analyzes the fetched modalriti specific command from the multimodal application to detect the (in this example, run) CMMT. 일단 검출되는 경우, 멀티모달 음성XML 해석기(50)는 CMMT를 해석하고 필요한 경우에 텍스트 모드를 위한 HTML과 같은 임의의 다른 모달리티 특정 명령을 얻는다. 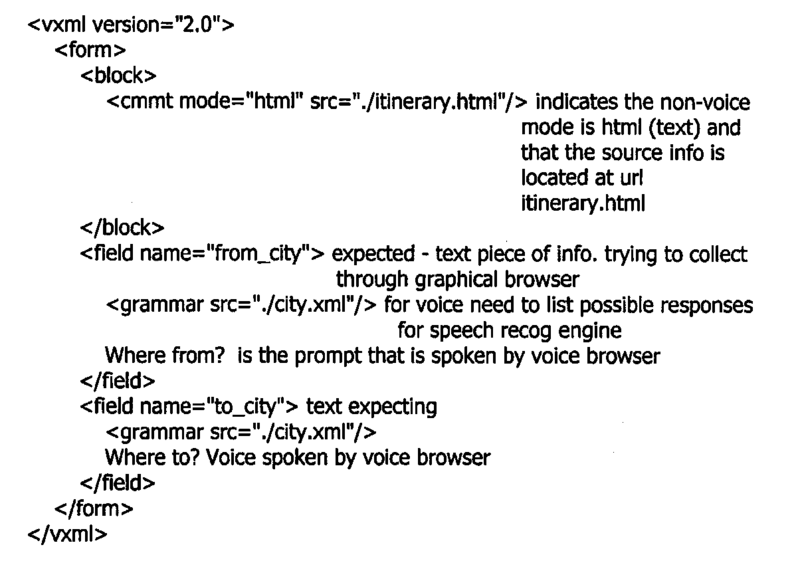 If one is detected, a multi-modal voice XML parser 50 obtains any other modalriti specific command, such as HTML for text mode if the analysis CMMT and necessary. 예를 들면, CMMT는 그래픽 브라우저에 대해 텍스트 정보를 어디에서 얻을 지를 가리킬 수 있다. For example, CMMT may indicate how and where to get text information for the graphical browser. 그래픽 브라우저가 "from city" 및 "to city"를 표시하는 동안에, 음성 브라우저에게 "where from" 및 "where to"를 묻는 음성을 출력하도록 요구하는 동시 멀티모달 어플리케이션에 대해 음성XML의 형식으로 된 동시 멀티모달 여정 어프리케이션에 대한 모달리티 특정 명령의 예를 도시하는 표가 아래에 제시된다. Graphical browsers "from city" and "to city" a while to display, voice browsers to the "where from" and "where to" Asked the same time for simultaneous multi-modal applications that require the output audio in the format of Voice XML the modalriti table showing an example of a specific command for the journey eopeu multimodal application is presented below. 다른 브라우저를 통해 사용자에 의해 입력되는 수신된 동시 멀티모달 정보는 "from city" 및 "to city"로 지정된 필드에 의해 예측된다. Concurrent multimodal information received as input by the user via a different browser is predicted by the field indicated by "city from" and "to city". 그러므로, 상기 마크업 언어 형식은 적어도 하나의 사용자 에이전트 프로그램에 대한 모달리티 특정 명령을 나타내는 베이스 마크업 언어로 저작되고, CMMT는 다른 모달리티로 동작하는 또 하나의 사용자 에이전트 프로그램에 대한 모달리티 특정 명령을 지정하는 확장자이다. Thus, the markup language format is authored by a base markup language representing modalriti specific command for at least one user agent program, CMMT is specifying the modalriti specific command for another user agent program operating in a different modalriti an extension. 블록 311에 도시된 바와 같이, 사용자가 선호도를 변경한 경우에, 방법은 프록시가 변경과 일치하도록 리셋하는 것을 포함한다. As shown in block 311, and if the user changes a preference, the method involves the proxy is reset to match the changes. 블록 312에 도시된 바와 같이, 멀티모달 퓨젼 서버(14)는 청취 포인트가 도달되었는지를 결정한다. As shown in block 312, the multimodal fusion server 14 determines that the listening point is reached. 그렇다면, 블록 314에 도시된 바와 같이, 다음 상태로 들어간다. Then, as shown in block 314, to enter the next state. 그렇다면, 프로세스는 종료한다. If so, the process ends. 그렇지 않다면, 방법은 다른 사용자 에이전트 프로그램에 대한 모달리티-특정 명령을 동기화하는 것을 포함한다. Otherwise, how modalriti to another user agent program comprises sync certain instruction. 본 예에서, 멀티모달 음성XML 해석기(50)는 복수의 사용자 에이전트 프로그램에 의한 동기화된 출력을 위해 사용자 에 이전트 프로그램(30)에 대한 HTML 및 사용자 에이전트(34)에 대한 음성XML을 동시 멀티모달 동기화 조정기(42)에 출력한다. In this example, the multi-modal voice XML parser 50 is simultaneous voice XML for HTML and a user agent 34 of the agent program 30 to the user for synchronized output by the plurality of user agent programs multimodal and it outputs a synchronization regulator 42. 이것은 예를 들면 상기 지적한 바와 같이 청취 포인트의 발생에 기초하여 수행될 수 있다. This can be done on the basis of for example the occurrence of the listening point, as noted above. 이것은 블록 316에 도시되어 있다. This is illustrated in block 316. 블록 318에 도시된 바와 같이, 방법은 동일한 세션 동안에 사용자에 의해 다른 모달리티로 사용자 입력 정보를 요구하도록 동기화된 모달리티-특정 명령(68 및 70)을 대응하는 프록시(38a 및 38n)에 예를 들면 동시 멀티모달 동기화 조정기(42)에 의해 전송하는 것을 포함한다. As shown in block 318, the method of modalriti synchronization to require user input to another modalriti by the user during the same session, for example, a proxy (38a and 38n) corresponding to a specific instruction 68 and 70 simultaneously It includes transmitting by the multimodal synchronization coordinator 42. 동기화된 요구(68 및 70)는 각 사용자 에이전트 프로그램(30 및 34)에 전송된다. The synchronization request (68 and 70) is transmitted to each of the user agent programs 30 and 34. 예를 들면, 다른 사용자 에이전트 프로그램과 연관된 복수의 입력 모달리티에 대응하는 동시 다른 모달리티 입력 정보에 대한 요구가 모달리티 특정 명령(68 및 70)을 포함하는 동기화된 요구로서 도시되어 있다. For example, there is a need for a simultaneous modalriti other input information corresponding to a plurality of input modalriti associated with different user agent programs are shown as the synchronization request including a specific instruction modalriti 68 and 70. 이들은 예를 들면 마크업 언어 형식으로 동기화될 수 있다. For example, it can be synchronized markup language format. 일단 사용자 에이전트 프로그램(30 및 34)이 모달리티-특정 명령을 동시에 렌더링하면, 방법은 블록 320에 도시된 바와 같이 타임 아웃 기간 내에 사용자 입력이 수신되었는지 여부 또는 다른 이벤트가 발생했는지를 결정한다. Once the user agent programs 30 and 34 are modalriti-rendered at the same time by a specific command, the method determines whether or not that or any other event occurs that the received user input is within the timeout period as shown in block 320. 예를 들면, 멀티모달 퓨젼 엔진(44)은 기간을 대기하여, 사용자에 의해 입력되는 멀티모달 입력 정보가 융합을 위해 복수의 사용자 에이전트 프로그램으로부터 적절하게 수신되었는지 여부를 결정한다. For example, the multimodal fusion engine 44 to wait for a period, it is determined whether or not the properly received from the plurality of user agent programs for fusing the multimodal input information input by the user. 이러한 대기 기간은 각 사용자 에이전트 프로그램의 모달리티 설정에 따른 다른 기간일 수 있다. This waiting period may be a different duration according to modalriti settings for each user agent program. 예를 들면, 사용자는 음성 및 텍스트 정보 모두를 동시에 입력할 예정이지만 멀티모달 퓨젼 엔진이 기간 내의 융합을 위 한 정보를 수신하지 못하는 경우, 에러가 발생되었다고 가정한다. For example, the user is assumed to enter a scheduled case both audio and text information, but at the same time, the multimodal fusion engine is not receiving the information above, a fusion within the period, that an error has occurred. 더구나, 음성 정보가 음성 게이트웨이(16)를 통해 처리되는데 더 많은 시간이 걸리므로, 멀티모달 퓨젼 엔진(44)은 텍스트 정보보다 음성 정보가 리턴되는데 더 많은 시간이 경과하도록 허용한다. Moreover, it allows voice information to it takes more time to be processed through a voice gateway 16, a multimodal fusion engine 44 will have more time there is the audio information returned than the text information. 본 예에서, 사용자에게 사용자 에이전트 프로그램(30)을 통해 텍스트를 입력하고, 사용자 에이전트 프로그램(34)에 음성 정보를 동시에 제공하기 위해 마이크로폰에 말하라고 요구된다. In this example, it is required to speak to a microphone to provide the input text to the user via the user agent program 30, and the audio information to the user agent program 34 at the same time. 사용자 에이전트 프로그램(30 및 34)으로부터 수신된 바와 같은 수신된 동시 멀티모달 입력 정보(72 및 74)는 적절한 통신 링크를 통해 각 프록시에 패싱된다. User agent programs 30 and 34, the received concurrent multimodal input information 72 and 74 as received from each proxy is passing through a suitable communication link. 유의할 점은, 사용자 에이전트 프로그램(34)과 디바이스(12)의 마이크로폰 및 스피커 사이에 참조부호 76으로 지정된 통신은 PCM 포맷 또는 임의의 다른 적절한 포맷으로 통신되고, 본 예에서는 사용자 에이전트 프로그램에 의해 출력되는 모달리티-특정 명령 포맷으로는 아니다. Note that the microphone and the communication specified between the speaker by the reference numeral 76 the user agent program 34 and the device 12 is being communicated to the PCM format or any other suitable format, in this example, output by the user agent program modalriti - is not a specific command formats. 사용자가 텍스트 브라우저 및 음성 브라우저를 통해 동시에 정보를 입력하여 멀티모달 퓨젼 엔진(44)이 복수의 사용자 에이전트 프로그램으로부터 전송된 동시 멀티모달 입력 정보를 수신한 경우, 멀티모달 퓨젼 엔진(44)은 블록 322에 도시된 바와 같이 사용자로부터 수신된 입력 정보(72 및 74)를 융합한다. If a user is received concurrent multimodal input information, the multimodal fusion engine 44, to enter the information at the same time through the text browser and voice browser is transmitted from the plurality of user agent programs, the multimodal fusion engine 44 has a block 322 the input information 72 and 74 received from the user, as shown in fuse. 도 4는 멀티모달 퓨젼 엔진(44)의 동작의 한 예를 예시하고 있다. Figure 4 illustrates an example of the operation of the multimodal fusion engine 44. 예시의 목적을 위해, 하나의 이벤트에 대해, "no input"은 이 모드를 통해 사용자에 의해 입력된 것이 아무것도 없음을 의미한다. For purposes of illustration,, "no input" for a single event means that the no anything entered by the user through the mode. "no match"는 입력이 되었지만 예상된 값이 아니라는 것을 의미한다. This input is "no match", but means that it is not the expected value. 결과는 사용자에 의한 성공적인 입력으로부터의 슬롯 (또는 필드) 이름 및 대응하는 값 쌍의 세트이다. The result is a slot (or field) name and a corresponding set of value pairs from the successful input by the user. 예를 들면, 성공적인 입력은 "City=Chicago", "state=Illinois", "Street"="first street", 및 예를 들면 0% 내지 100%인 신뢰 가중 인수일 수 있다. May be for example, a successful input is "City = Chicago", "state = Illinois", "Street" = "first street", and for example, the confidence weighting factor of 0% to 100%. 앞서서 지적한 바와 같이, 멀티모달 퓨젼 엔진(44)이 정보를 융합할지 여부는 슬롯 이름(예를 들면, 변수) 및 값 쌍의 수신 또는 예상 수신 간의 시간량 또는 다른 이벤트의 수신에 기초하여 좌우될 수 있다. Status As indicated before, whether the multimodal fusion engine 44, the fuse information, slot names (e.g., variables) and value pairs of the received or to be influenced on the basis of the reception of the amount of time or other event between the estimated received have. 방법은 신뢰 레벨이 수신된 정보에 할당된 것으로 가정한다. Method is assumed to be assigned to the confidence level of the received information. 예를 들면, 동기화 조정기는 모달리티 및 정보 도달 시간에 기초하여 신뢰를 가중한다. For example, synchronization regulator is weighted based on a trust modalriti information and arrival times. 예를 들면, 동일한 세션 동안에 동일한 슬롯 데이터가 다른 모드를 통해 입력될 수 있는 경우에(예를 들면, 거리 이름을 말하고 이를 타이핑함) 말로 표현된 데이터보다 타이핑된 데이터가 더 정확한 것으로 가정한다. For example, it is assumed that if the same slot data during the same session may be entered via a different mode than the data type the data expressed in words (e.g., speaking the name of the street also this type) is to be more accurate. 동기화 조정기는 수신된 시간 및 수신된 개별 결과들의 신뢰 값들에 기초하여 동시 다른 멀티모달 정보에 대한 요구에 응답하여 저농된 복수의 사용자 에이전트 프로그램들 중 하나로부터 전송된 수신된 멀티모달 입력 정보를 조합한다. Synchronization regulator is a combination of simultaneous different multimodal information, the received multimodal input information sent from one of the plurality of user agent that is responsive to a request low concentrations program on basis of the confidence values ​​of the received time and a receive individual results . 블록 400에 도시된 바와 같이, 방법은 이벤트 또는 비음성 모드로부터의 결과가 있었는지 여부를 결정하는 것을 포함한다. As shown in block 400, the method includes determining whether there are results from the events or non-speech mode. 그렇다면, 블록 402에 도시된 바와 같이, 방법은 "no input" 및 "no match"이벤트를 제외하고 임의의 모드로부터 임의의 이벤트가 있었는지 여부를 결정하는 것을 포함한다. If so, involves the exception of the above, methods are "no input" and "no match" event as shown in block 402 and determines whether there is any event from a certain mode. 예라면, 방법은 블록 404에 도시된 바와 같이 해석기(50)에 수신된 제1 그러한 이벤트를 리턴하는 것을 포함한다. If yes, the method includes returning the first such event is received in the analyzer 50 as shown in block 404. 그러나, "no input" 및 "no match"를 제외하고 사용자 에이전트 프로그램으로부터 이벤트가 존재하지 않은 경우, 프로세스는 블록 406에 도시된 바와 같 이 멀티모달 퓨젼 엔진에 대한 2개 이상의 결과를 전송한 임의의 모드에 대해 수신된 시간 순서로 그 모드의 결과를 조합하는 것을 포함하는 방법을 포함한다. However, "no input", and if "no match" that is, the event exists, from the user agent programs, except for the process is to transfer the two or more results for the multimodal fusion engine, such a shown in block 406, any in the time order received for the mode includes a method which comprises combining the result of that mode. 이것은 사용자가 동일한 슬롯에 대해 입력을 재입력하는 경우에 유용하다. This is useful when the user re-enter the input for the same slot. 주어진 슬롯 이름에 대한 나중 값은 이전 값들을 무시한다. Later values ​​for a given slot name should ignore the previous value. 멀티모달 퓨젼 엔진은 이를 구성하는 개별적인 결과들의 신뢰 가중에 기초하여 모드의 결과 신뢰 가중을 조정한다. Multimodal fusion engine to adjust the trust weights result of the mode on the basis of the confidence weighting of the individual results that make them. 각 모달리티에 대해, 최종 결과는 각 슬롯 이름에 대한 하나의 답변이다. For each modalriti, the end result is one of the answers to the name of each slot. 방법은 블록 408에 도시된 바와 같이, 블록 406으로부터 임의의 결과를 취하고 이들을 모든 모드에 대한 하나의 조합된 결과로 조합하는 것을 포함한다. Method comprises a combination as shown in block 408, take any of the results from block 406, these as a result of the combination of all modes. 방법은 최소 신뢰 결과로 시작하여 최대 신뢰 결과로 진행하는 것을 포함한다. How to start with a minimum of trust that goes with a maximum results, including trust the results. 융합된 결과의 각 슬롯 이름은 그 슬롯의 정의를 가지는 최대 신뢰 입력 결과에 속하는 슬롯 값을 수신한다. Each name slot in the fused results receives the value of a slot belonging to the maximum trust type having a positive result of that slot. 블록 400으로 리턴하여, 이벤트 또는 비음성 모드로부터의 결과가 없는 경우, 방법은 음성 모드가 결과를 리턴했는지, 즉 사용자 에이전트 프로그램(34)이 수신된 정보(74)를 생성했는지를 결정하는 것을 포함한다. If the return to the block 400, there is no result from the event or non-voice mode, the method includes determining whether the audio mode is that return a result, i.e., the user agent program 34 is generated for the received information (74) do. 이것은 블록 420에 도시되어 있다. This is illustrated in block 420. 그렇다면, 블록 422에 도시된 바와 같이, 방법은 수신된 입력 정보의 음성 응답을 멀티모달 어플리케이션(54)에 리턴하는 것을 포함한다. If so, the method as shown in block 422 is included to return the voice responses of the received input information to the multimodal application 54. 그러나, 음성 브라우저(예를 들면, 사용자 에이전트 프로그램)가 정보를 출력하지 않은 경우, 방법은 블록 424에 도시된 바와 같이 음성 모드가 이벤트를 리턴했는지를 결정하는 것을 포함한다. However, the voice browser, and when (e. G., The user agent program) that is not outputting the information, the method includes determining whether the voice mode returns an event as shown in block 424. 예라면, 그 이벤트가 블록 426에 도시된 바와 같이 멀티모달 어플리케이션(54)에 보고된다(참조부호 73). If yes, the event is reported to the multimodal application 54, as shown in block 426 (reference numeral 73). 음성 모드 이벤트가 전혀 생성되지 않았다면, 방법은 블록 428에 도시된 바와 같이 "no input"이벤트를 리턴하는 것을 포함한다. An audio mode has not been generated at all events, the method includes returning a "no input" event as shown in block 428. 이하의 표 2는 가상의 데이터에 적용된 도 4의 방법의 예를 예시하고 있다. The following table 2 illustrates an example of Figure 4 applied to the data of the virtual method. 예를 들면, 블록 400에서 비음성 모드로부터 어떠한 결과도 수신되지 않은 경우, 모드는 블록 402로 진행한다. For example, if it is not receiving any results from the non-speech mode at block 400, the mode proceeds to block 402. 블록 402에서 , 어떠한 이벤트도 수신되지 않으면, 방법은 블록 406으로 진행한다. If at block 402, some event is received, the method proceeds to block 406. 블록 406에서, 퓨젼 엔진은 TextModeCollectedData를 슬롯당 하나의 응답으로 붕괴시킨다. In block 406, the infusion engine disrupt the TextModeCollectedData with one response per slot. VoiceModeCollectedData는 그대로 유지된다. VoiceModeCollectedData is maintained. 음성 모드는 그대로 유지된다. Voice mode is maintained. 그러나, 0.85가 결과 셋트에서 최하위 신뢰이므로 0.85의 전체 신뢰값이 할당된다. However, since 0.85 is the lowest confidence in the result set is assigned a total credit value of 0.85. 텍스트 모드는 그 슬롯이 LaSalle의 나중 시간스탬프로 채워졌으므로 수집된 데이터로부터 Michigan을 제거한다. 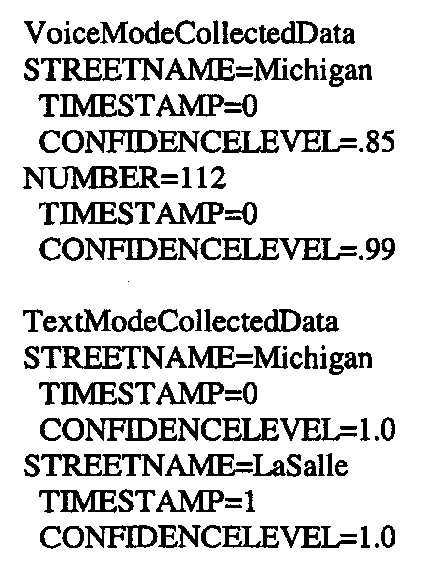 Text mode jyeoteumeuro that the slot is filled with a later time stamp of the LaSalle removes Michigan from the collected data. 최종 결과를 이와 같이 보인다. The end result looks like this. 1.0이 결과 셋트에서 최하위 신뢰 레벨이므로 1.0의 전체 신뢰 레벨이 할당된다. Since 1.0 is the lowest confidence level in the result set is assigned a total confidence level of 1.0. 이어지는 것은 블록 408에 전송된 데이터이다. It is the data transmitted to the block 408 leads. 블록 408에서, 2가지 모드가 하나의 리턴 결과로 유효하게 융합된다. In block 408, is fused to two modes are available in one of the return results. 우선, 최하위 신뢰 레벨의 전체 결과가 취해져 최종 결과 구조에 도입된다. First, the overall result in the lowest confidence level is taken and introduced into the bottom line structure. 그리고나서, 다음 최하위 결과의 임의의 요소가 최종 결과로 대체된다. Then, the following any element of the least significant result is replaced with the final result. 이러한 최종 결과는 2가지 모달리티의 융합으로부터 나타나고, 이는 다음에 무엇을 할지를 결정하는 해석기에 전송된다(웹으로부터 더 많은 정보를 페치하거나 더 많은 정보를 결정하는 것은 사용자로부터 요구되고 이들 현재 상태에 기초하여 재-프 롬프트한다.) The final result appears from the fusion of two modalriti, which by, determining what is transmitted by the analyzer to determine (more fetch information or more information from the web to the next request from the user and, based on these current state re - should prompt). 도 5는 동시 멀티모달 세션 지속성 컨트롤러(600) 및 동시 멀티모달 세션 지속성 컨트롤러(600)에 결합되는 동시 멀티모달 세션 상태 메모리(602)를 포함하는 멀티모달 퓨젼 서버(14)의 다른 실시예를 예시하고 있다. Figure 5 illustrates another embodiment of a concurrent multimodal session persistence controller 600 and simultaneously multimodal session persistence controller multimodal fusion server 14 which includes the simultaneous multimodal session state memory 602 coupled to 600 and. 동시 멀티모달 모덜 세션 지속성 컨트롤러(600)는 적절한 처리 디바이스 상에서 운용되는 소프트웨어 모듈이거나, 임의의 적절한 하드웨어, 소프트웨어, 펌웨어 또는 이들의 임의의 적절한 조합일 수 있다. Concurrent multimodal session persistence modal controller 600 may be a software module running on an appropriate processing device, it may be any suitable hardware, software, firmware, or any suitable combination of these. 동시 멀티모달 세션 지속성 컨트롤러(600)는 비-세션 조건 동안에 사용자별 기반으로 동시 멀티모달 세션 상태 정보(604)를 데이터베이스 또는 다른 적절한 데이터 구조의 형태로 유지한다. Concurrent multimodal session persistence controller 600 includes a non-holding concurrent multimodal session status information 604 based on a user-by-user during the session condition in the form of a database or other suitable data structure. 동시 멀티모달 세션 상태 정보(604)는 세션 동안에 다른 동시 모달리티 통신을 위해 구성된 복수의 사용자 에이전트 프로그램의 상태 정보이다. Concurrent multimodal session status information 604 is state information of the plurality of user agent programs that are configured for different concurrent modalriti communicated during the session. 동시 멀티모달 세션 지속성 컨트롤러(600)는 동시 멀티모달 세션 상태 정보(604)를 액세스하는 것에 응답하여 이전에 종료된 동시 멀티모달 세션을 재-확립한다. Concurrent multimodal session persistence controller 600 is re-concurrent multimodal session ended before the response to accessing the concurrent multimodal session status information 604 - establishes. 멀티모달 세션 컨트롤러(40)는 사용자가 세션에 참여했을 때 동시 멀티모달 세션 지속성 컨트롤러(600)에 통지한다. Multimodal session controller 40 notifies the concurrent multimodal session persistence controller 600 when the user participates in the session. 멀티모달 세션 컨트롤러(40)는 또한 동시 멀티모달 동기화 조정기와 통신하여, 오프라인 디바이스와의 통기화를 제공하거나 동시 멀티모달 세션을 재확립하는데 필요한 임의의 사용자 에이전트 프로그램과 동기화한다. Multimodal session controller 40 also communicates with the concurrent multimodal synchronization coordinator, provides aeration of the screen and the off-line device or synchronized with any of the user agent programs required to re-establish a concurrent multimodal session. 동시 멀티모달 세션 지속성 컨트롤러(600)는 예를 들면 이전 동시 멀티모달 통신 세션 동안에 주어진 모드에 이용되는 프록시를 가르키는 URL과 같은 프록시 ID 데이터(906)를 저장한다. Concurrent multimodal session persistence controller 600, for example, and stores the proxy ID data 906, such as a URL pointing to the proxy for use in a given mode during a previous concurrent multimodal communication session. 원하는 경우, 동시 멀티모달 세션 상태 메모리(602) 는 임의의 그러한 필드 또는 슬롯의 컨텐트와 함께 이전 동시 멀티모달 통신 세션 동안에 사용자 입력에 의해 어느 필드 또는 슬롯이 채워졌는지를 가리키는 정보를 포함할 수 있다. If desired, co-multimodal session state memory 602 may include information indicating whether any field or is filled slot by user input during a previous concurrent multimodal communication session with any of the content of that field or slot. 뿐만 아니라, 동시 멀티모달 세션 상태 메모리(602)는 동시 멀티모달 통신 세션에 대한 현재 다이얼로그 상태(606)를 포함한다. As well as, the simultaneous multimodal session state memory 602 comprises a current dialog state 606 to the concurrent multimodal communication session. 일부 상태들은 실행중인 어플리케이션의 실행시 해석기(50)가 존재하는 장소를 포함한다. Some conditions comprise the location of the interpreter (50) during execution of the application is running there. 사용자에 의해 채워진 필드 상의 정보는 융합된 입력 정보(60)의 형태로 되어 있다. Information on the field filled by the user is in the form of a fused input information 60. 도시된 바와 같이, 웹 서버(18)는 각 모달리티 타입에 대해 모달리티 특정 명령을 제공한다. As shown, the web server 18 provides the modalriti specific commands for each type modalriti. 본 예에서, 텍스트는 HTML의 형식으로 제공되고, 음성은 음성XML의 형식으로 제공되며, 음성은 WML 형식으로 제공된다. In this example, the text is available in HTML format, the audio is provided in the form of voice XML, voice is provided as a WML format. 동기 멀티모달 동기화 조정기(42)는 적절한 형식을 적절한 프록시에 출력한다. Synchronous multimodal synchronization coordinator 42 outputs the appropriate format to the appropriate proxy. 도시된 바와 같이, 음성XML 형식은 음성 브라우저에 대해 지정된 프록시(38a)를 통해 출력되는데 반해, HTML 형식은 그래픽 브라우저에 대한 프록시(38n)에 출력된다. As shown, the audio format is XML, while there is output via a proxy (38a) specified for the voice browser, HTML format is output to a proxy (38n) for the graphical browser. 세션 지속성 유지는 세션이 비정상적으로 종료되고 사용자가 나중에 동일한 다이얼로그 상태로 되돌아오고 싶은 경우에 유용하다. Maintain session persistence is useful if the session ends abnormally and you want to come back to the same dialogue state later. 다른 모달리티에서 입력과 출력 사이에서 래그 시간을 유발하고 시간 지연을 보상하기 위해 일시적으로 정보를 저장할 필요를 생성하는 다른 지연 특성을 가지는 모달리티 이용 트랜스포트 메커니즘에 유용하다. Causing a lag time between the input and the output in other modalriti and are useful in the modalriti using a transport mechanism having a different characteristic delay to generate a temporary need to store the information to compensate for the time delay. 도 6-7에 도시된 바와 같이, 동시 멀티모달 세션 지속성 컨트롤러(600)는 주어진 세션에 대해 주어진 사용자에 대한 복수의 사용자 에이전트 프로그램을 위한 멀티모달 세션 상태 정보를 유지하고, 사용자 에이전트 프로그램은 세션 동안에 다 른 동시 모달리티 통신을 위해 구성되었다. As shown in Figure 6-7, concurrent multimodal session persistence controller 600 maintains the multimodal session status information for the plurality of user agent programs for a given user for a given session, the user agent programs during a session the other has been configured for simultaneous communication modalriti. 이것은 블록 700에 도시되어 있다. This is illustrated in block 700. 블록 702에 도시된 바와 같이, 방법은 멀티모달 세션 상태 정보(604)에 액세스하는 것에 응답하여 이전 동시 멀티모달 세션을 재확립하는 것을 포함한다. As shown in block 702, the method includes re-establishing the previous concurrent multimodal session in response to accessing the multimodal session status information 604. 블록 704에 더 상세하게 도시된 바와 같이, 동시 멀티모달 세션 동안에, 동시 멀티모달 세션 지속성 컨트롤러(600)는 메모리(602)에 사용자당 멀티모달 세션 상태 정보(604)를 저장한다. As more particularly shown in block 704, during the concurrent multimodal session, the concurrent multimodal session persistence controller 600 stores the multimodal session status information 604 in the memory per user 602. The 블록 706에 도시된 바와 같이, 동시 멀티모달 세션 지속성 컨트롤러(600)는 세션 컨트롤러로부터 사용자에 의한 세션의 참여를 검출하고, 사용자 ID에 대한 메모리를 탐색하여 사용자가 이전 동시 멀티모달 세션에 참여했는지를 결정한다. Whether the concurrent multimodal session persistence controller 600 includes a user joins a concurrent multimodal session transfer to search the memory for detecting the engagement, and the user ID of the session by the user from the session controller, as shown in block 706 determined. 따라서, 블록 708에 도시된 바와 같이, 방법은 세션에 참여하는 사용자의 검출에 기초하여 메모리(602)의 저장된 멀티모달 세션 상태 정보(604)에 액세스하는 것을 포함한다. Thus, As, how shown in block 708 including those based on the detection of the users participating in the session to access the multimodal session status information 604 stored in memory 602. 블록 710에 도시된 바와 같이, 방법은 세션이 메모리(640)에 존재하는지를 결정하는 것을 포함한다. The method as shown in block 710 includes determining whether the session exists in the memory 640. 그렇지 않은 경우, 세션은 새로운 세션으로서 지정되고, 새로운 세션을 메모리(602)에 기록하기 위한 필수적인 데이터를 차지하도록 새로운 엔트리가 생성된다. Otherwise, the session is designated as a new session, a new entry is created to take up the necessary data for recording the new session in the memory 602. The 이것은 블록 712에 도시되어 있다. This is illustrated in block 712. 블록 714에 도시된 바와 같이, 세션이 존재하는 경우, 즉 세션 ID가 메모리(602)에 존재하는 경우, 방법은 사용자가 운용 중인 존재하는 어플리케이션을 가지고 있는 경우에, 그리고 그렇다면 사용자가 어플리케이션과 통신을 재확립하고 싶은 경우에, 메모리(602)에 질의하는 것을 포함한다. When, session exists as shown in block 714, that is, when there is a session ID, if present in memory 602, the method has application to present the user is operating, and if so the user application and the communications if you want to re-establish, it includes querying the memory 602. 사용자가 그렇게 원한다면, 방법은 메모리(602)로부터 최종 페치된 정보의 URL을 검색하는 것을 포함한다. The user wishes so, then the method includes retrieving the URL of the last fetch information from the memory 602. 이것은 블록 716(도 7)에 도시되어 있다. This is illustrated in block 716 (FIG. 7). 블록 718에 도시된 바와 같이, 적절한 프록시(38a-38n)에는 블록 716에서 검색된 대로 적절한 URL이 주어진다. As it is shown in block 718, given the appropriate URL as found in block 716, the appropriate proxy (38a-38n). 블록 720에 도시된 바와 같이, 방법은 메모리(602)에 저장된 저장된 사용자 에이전트 상태 정보(606)에 기초하여 프록시를 통해 적절한 사용자 에이전트 프로그램에 요구를 전송하는 것을 포함한다. As shown in block 720, the method includes on the basis of the stored user agent status information 606 stored in memory 602 sends a request to the appropriate user agent programs through a proxy. 도 8은 동시 멀티모달 세션 상태 메모리(602)의 컨텐트의 하나의 예를 예시하는 도이다. 8 is a diagram illustrating an example of the contents of the concurrent multimodal session state memory 602. 도시된 바와 같이, 사용자 ID(900)는 특정 사용자를 지정하고 세션 ID(902)는 사용자가 메모리(602)에 저장된 복수의 세션을 가지고 있는 경우에 사용자 ID와 연관된다. As shown, a user ID (900) is associated with a user ID in the case with a plurality of sessions to specify a particular user and session ID (902) by the user stored in the memory 602. The 뿐만 아니라, 사용자 에이전트 프로그램 ID(904)는 예를 들면 어느 디바이스가 특정 사용자 에이전트 프로그램을 운용하고 있는지에 관한 디바이스 ID를 가리킨다. In addition, the user agent program ID (904) is, for example, refers to a device ID according to whether the device which is operating the particular user agent program. 프로그램 ID는 사용자 프로글매 식별자, URL 또는 다른 어드레스일 수 있다. Program ID may be a user profile geulmae identifier, URL or other address. 멀티모달 프록시를 가리키는 프록시 ID 데이터(96)는 이전 동시 멀티모달 통신 동안에 이용된다. Multi-modal proxy ID data indicating the proxy 96 is used during a previous concurrent multimodal communication. 그러한 것으로서, 사용자는 세션을 종료하고 나중에 사용자가 떠난 곳에서 계속할 수 있다. As such, the user can continue from where the user ends the session, and later left. 디바이스 ID(904)를 유지하는 것은 특히 시스템이 동시 멀티모달 세션 동안에 채용되는 디바이스의 식별을 유지할 수 있게 하여, 동시 멀티모달 통신 동안에 사용자에 의한 디바이스의 스위칭을 용이하게 한다. For holding the device ID (904) It makes the system especially easy switching of the device by the user during simultaneous multi-modal communication, and to maintain the identity of the device that is employed during concurrent multimodal session. 따라서, 하나 이상의 디바이스들에 걸쳐 분산된 분리된 사용자 에이전트 프로그램을 통해 다른 모달리티를 통해 입력되는 다중 입력들은 (또는 이들이 동일한 디바이스에 포함된 경우에) 단일성있고 응집성있게 융합된다. Thus, through a separate user agent program distributed over one or more multiple input devices inputted through the other modalriti are one (or if they are included in the same device), and is fused so coherent. 또한, 사용자 에이전트 프로그램의 렌더링 및 이들 사용자 에이전트 프로그램을 통한 사용자에 의한 정보 입력을 동기화하는 메커니즘이 제공된다. In addition, a mechanism for synchronizing the input information by the user through a rendering and these user-agent application on the user agent program is provided. 뿐만 아니라, 기재된 멀티모달 퓨젼 서버는 존재하는 디바이스 및 게이트웨이에 결합되어 동시 멀티모달 통신 세션을 제공할 수 있다. In addition, the multimodal fusion server described is coupled to an existing device and the gateway can provide concurrent multimodal communication session. 여러 가지 양태의 본 발명의 다른 변동 및 변형 구현이 본 기술분야의 통상의 기술자에게는 알려져 있고 본 발명이 기재된 특정 실시예들로 제한되지 않는다는 것은 자명하다. It is to be understood known to skilled in the various aspects of the different variations and modifications of this technique is implemented in the art and that the invention is not limited to the specific embodiments described. 예를 들면, 방법들이 특정 단계들로 기재되어 있지만, 상기 단계들은 원하는 대로 임의의 적절한 순서로 수행될 수 있다는 것은 자명하다. For example, although methods have been described to a certain stage, the steps are obvious that it can be performed in any suitable order as desired. 그러므로, 여기에 기재되고 청구되는 기본적인 원리의 사상과 범주내에 드는 임의의 그리고 모든 변형, 변동 또는 등가를 본 발명이 포함한다는 것을 잘 알고 있을 것이다. Thus, it described herein are any and all modifications, variations or equivalents as fall within the spirit and scope of the basic principle that charge will appreciate that includes the present invention. 를 포함하는 멀티모달 통신 방법. Multimodal communication comprises a. 제1항에 있어서, 상기 복수의 사용자 에이전트 프로그램에 의한 출력을 동기화하는 단계는 상기 복수의 사용자 에이전트 프로그램에 의한 이용을 위해, 각 사용자 에이전트 프로그램이 마크업 언어의 적어도 일부에 기초하여 다른 모달리티로 정보를 출력하도록, 다른 모달리티를 나타내는 마크업 언어의 적어도 일부를 전송하는 단계를 포함하는 멀티모달 통신 방법. The method of claim 1, wherein the step of synchronizing the output by the plurality of user agent programs, and for use by the plurality of user agent programs, each user agent program based on at least a portion of the markup language information to another modalriti multimodal communication method including the a, sending at least a portion of markup language representing different modalriti to output. 제2항에 있어서, 상기 복수의 사용자 에이전트 프로그램 중 하나는 그래픽 브라우저를 포함하고, 상기 복수의 사용자 에이전트 프로그램 중 다른 하나는 음성 브라우저를 포함하며, 상기 복수의 사용자 에이전트 프로그램으로부터의 출력은 상기 복수의 사용자 에이전트 프로그램을 통해 다른 모달리티로 동시에 입력되는 사용자 입력을 포함하는 멀티모달 통신 방법. The method of claim 2, wherein one of the plurality of user agent programs includes a graphical browser, and the other of the plurality of user agent programs includes a voice browser, the output from the plurality of user agent programs of the plurality of multimodal communication method including a user input via the user agent program to be simultaneously input to another modalriti. 제2항에 있어서, 상기 복수의 사용자 에이전트 프로그램에 의한 이용을 위해, 다른 모달리티를 나타내는 마크업 언어의 적어도 일부를 전송하는 단계는 다른 모달리티에 연관된 마크업 언어 형식을 다른 디바이스에 전송하는 단계를 포함하고, 상기 디바이스 각각은 상기 복수의 사용자 에이전트 프로그램 중 하나를 동작시키는 멀티모달 통신 방법. The method of claim 2, wherein the for use by the plurality of user agent programs, transmitting at least part of the markup language representing different modalriti comprises the step of transmitting a markup language format associated with the other modalriti other devices and wherein each said device is a multimodal communication method of operating one of the plurality of user agent programs. 제2항에 있어서, 상기 복수의 사용자 에이전트 프로그램에 의한 이용을 위해, 다른 모달리티를 나타내는 마크업 언어의 적어도 일부를 전송하는 단계는 다른 모달리티에 연관된 마크업 언어 형식을 동일한 디바이스에 전송하는 단계를 포함하고, 상기 디바이스는 상기 복수의 사용자 에이전트 프로그램을 다른 모드로 동작시키는 멀티모달 통신 방법. The method of claim 2, wherein the for use by the plurality of user agent programs, transmitting at least part of the markup language representing different modalriti comprises the step of transmitting a markup language format associated with the other modalriti the same device , wherein the device is a multimodal communication method of operating a plurality of user agent programs to another mode. 제1항에 있어서, 세션 동안에 상기 복수의 사용자 에이전트 프로그램 각각과 통신하기 위한 프록시를 결정하는 단계를 포함하는 멀티모달 통신 방법. The method of claim 1, wherein the multi-modal communication determining a proxy for communication with each of the plurality of user agent programs during a session. 제2항에 있어서, 상기 복수의 사용자 에이전트 프로그램을 위한 모달리티 특정 명령을 얻는 단계는 상기 복수의 사용자 에이전트 프로그램 각각에 대해 다른 마크업 언어 형식를 제공하는 어플리케이션과 통신하는 단계를 포함하고, 상기 다른 마크업 언어 형식은 다른 모달리티를 나타내는 멀티모달 통신 방법. The method of claim 2, wherein obtaining a modalriti specific commands for the plurality of user agent programs includes a step of communicating with an application provided by another markup language hyeongsikreul for each of the plurality of user agent programs, the other markup language format is a multi-modal communication method represents another modalriti. 제1항에 있어서, 다른 모달리티로 동작하는 상기 복수의 사용자 에이전트 프로그램에 대한 모달리티 특정 명령을 얻는 단계는 적어도 하나의 사용자 에이전트 프로그램에 대한 모달리티 특정 명령을 나타내는 베이스 마크업 언어로 저작된 마크업 언어 형식을 페치하는 단계를 포함하고, 상기 마크업 언어 형식은 다른 모달리티로 동작하는 다른 사용자 에이전트 프로그램에 대한 모달리티 특정 명령을 식별하는 데이터를 포함하는 멀티모달 통신 방법. The method of claim 1 wherein modalriti obtain the specific command is at least one user agent program modalriti base markup language markup language format authoring representing a specific command for the for the plurality of user agent programs that operate in different modalriti comprising the step of fetching, and the markup language format is a multimodal communication comprising data identifying the modalriti specific commands for another user agent program operating in a different modalriti. 제1항에 있어서, 상기 모달리티 특정 명령에 기초하여 상기 복수의 사용자 에이전트 프로그램으로부터의 출력을 동기화하는 단계는, 동시 멀티모달 태그(CMMT)를 검출하기 위해 멀티모달 어플리케이션으로부터의 페치된 모달리티 특정 명령을 분석하고 검출된 경우에 CMMT에 기초하여 적어도 하나의 사용자 에이전트 프로그램에 대한 모달리티 특정 명령을 얻는 단계를 포함하는 멀티모달 통신 방법. The method of claim 1, further comprising the modalriti the basis of a specific command synchronizing the output from the plurality of user agent programs, the fetched modalriti specific command from the multimodal application to detect the concurrent multimodal tag (CMMT) multimodal communication method based on CMMT if the analyzing and detecting includes a step of obtaining a modalriti specific command for at least one user agent program. 를 포함하는 멀티모달 네트워크 요소. Multimodal network element comprising a. 제10항에 있어서, 상기 동시 멀티모달 동기화 조정기는 세션 동안에 상기 복수의 사용자 에이전트 프로그램 각각과 통신하기 위한 프록시를 결정하는 멀티모달 네트워크 요소. 11. The method of claim 10, wherein concurrent multimodal synchronization coordinator is multimodal network element for determining a proxy for communication with each of the plurality of user agent programs during a session. 제12항에 있어서, 상기 동시 멀티모달 입력 정보가 융합을 위해 적절하게 수신되었는지를 결정하기 위해 기간을 기다리는 단계를 포함하는 멀티모달 통신 방법. 13. The method of claim 12, wherein the multimodal communication comprising the step of waiting a period of time to determine if the concurrent multimodal input information is received, as appropriate for fusion. 제14항에 있어서, 각 사용자 에이전트 프로그램의 모달리티에 따라 다른 기간을 기다리는 단계를 포함하는 멀티모달 통신 방법. The method of claim 14 wherein the multimodal communication comprising the step of waiting a period of time according to another modalriti of each user agent program. 제12항에 있어서, 복수의 입력 모달리티에 대응하는 동시 멀티모달 입력 정보에 대한 요구를 전송하는 단계는, 다른 모달리티로 정보의 동시 입력을 요구하도록, 서로에 대해 다른 모달리티로 동작하는 복수의 사용자 에이전트 프로그램에 대한 모달리티 특정 명령을 전송하는 단계를 포함하는 멀티모달 통신 방법. 13. The method of claim 12, wherein sending the request for concurrent multimodal input information corresponding to a plurality of input modalriti is to require the simultaneous input of information to another modalriti, a plurality of user agent operative to another modalriti relative to one another modalriti multimodal communication method for sending a specific command to the program. 제12항에 있어서, 복수의 입력 모달리티에 대응하는 동시 멀티모달 입력 정보에 대한 요구를 전송하는 단계는, 제1 모달리티 기반 마크업 언어 형식을 디바이스에 전송하고 제2 모달리티 마크업 언어 기반 형식을 하나 이상의 디바이스에 전송하여 다른 모달리티로 정보의 동시 입력을 요구하는 단계를 포함하는 멀티모달 통신 방법. 13. The method of claim 12, wherein sending the request for concurrent multimodal input information corresponding to a plurality of input modalriti is, one of the first modalriti based markup transfer the language format to the device and a second modalriti markup language based format transmitted by a multi-modal communication method including the step of requiring simultaneous input of information to another modalriti in one device. 제12항에 있어서, 수신된 시간 및 수신된 개별적인 결과의 신뢰값에 기초하여 동시 다른 멀티모달 정보에 대한 요구에 응답하여 전송된 상기 복수의 사용자 에이전트 프로그램 중 하나로부터 전송된 수신된 멀티모달 입력 정보를 조합하는 단계를 포함하는 멀티모달 통신 방법. 13. The method of claim 12, the received time and the received transmission from one of the same time other multi the plurality of in response to a request for the modal information transmitted user agent programs based on confidence values ​​of individual results received multimodal input information multimodal communication comprising the step of combining. 제12항에 있어서, 다른 모달리티로 동작하고 있는 다른 사용자 에이전트 프로그램에 대한 모달리티 특정 명령을 식별하는 데이터를 포함하도록 모달리티 특정 명령을 트랜스코딩하는 단계를 포함하는 멀티모달 통신 방법. According, modalriti multimodal communication comprising the step of transcoding the particular command modalriti to include data that identifies the specific command for the other modalriti different user agent programs that are operating in the claim 12. 을 포함하는 멀티모달 네트워크 요소. Multi-modal network elements, including. 제20항에 있어서, 마크업 언어 해석기에 동작가능하게 결합되는 마크업 언어 해석기 및 트랜스코더를 포함하고, 상기 트랜스코더는 다른 모달리티로 동작하는 다른 사용자 에이전트 프로그램에 대한 모달리티 특정 명령을 식별하는 데이터를 포함하는 모달리티 특정 명령을 트랜스코딩하는 멀티모달 네트워크 요소. 21. The method of claim 20, operable with the markup language interpreter to contain a markup language interpreter and the transcoder is coupled, and wherein the transcoder is data identifying the modalriti specific commands for the different user agent programs that operate in different modalriti modalriti including multi-modal network elements to transcode a particular instruction.